복수의 전자 장치를 포함하는 전자 장치 네트워크가 본 명세서에 개시되어 있다. The electronic device is a network that includes a plurality of electronic devices are disclosed herein. 전자 장치 각각은 전자 장치에 존재하는 펌웨어/소프트웨어를 업데이트하도록 구성된 업데이트 소프트웨어를 가질 수 있다. Each electronic device may have a software update is configured to update the firmware / software in the electronic device. 전자 장치는 또한 전자 장치 내의 업데이트 소프트웨어를 업데이트하기 위한 부가의 소프트웨어를 이용할 수 있다. Electronic device may also use the add-in software for updating the software update in the electronic device. 전자 장치는 또한 현재 버전의 업데이트 소프트웨어가 호출되어야 하는지 또는 이전의 백업 버전의 업데이트 소프트웨어가 호출되어야 하는지를 판정하도록 구성되어 있는 소프트웨어를 가질 수 있다. The electronic device may also have software that is configured to determine if the current version of update software that is to be called back or the previous version of the updated software is to be called. 이 판정은 업데이트 상태 표시자에 존재하는 상태 정보에 기초하여 행해질 수 있다. This determination can be made based on status information that exists in the update status indicator. 상태 정보는 어떤 업데이트도 수행하지 않는 통상의 시동 동작보다는, 업데이트 소프트웨어에 대한 업데이트가 행해져야 함을 나타낼 수 있다. The status information than a normal start-up operation that does not perform any update may indicate that an update should be performed for updating the software. 네트워크는 또한 전자 장치에서의 업데이트 소프트웨어를 업데이트하는 데 사용하기 위한 업데이트를 생성하도록 구성되어 있는 업데이트 생성자를 포함할 수 있다. The network may also include an update generator that is configured to generate an update to be used to update the update software in an electronic device. 이동 전화 및 개인 휴대 단말기(PDA) 등의 전자 장치는 종종 전자 장치의 제조업자에 의해, 전기 통신 사업자에 의해, 또는 제3자에 의해 제공되는 펌웨어 및/또는 소프트웨어 애플리케이션을 포함한다. Electronic devices such as mobile phones and personal digital assistants (PDA) often include a firmware and / or software applications provided by the by the electric carriers, by the electronic device manufacturer, or a third party. 이들 펌웨어 및 소프트웨어 애플리케이션은 종종 버그(bug)를 포함하고 있다. The firmware and software applications frequently contain bugs (bug). 버그를 수정하기 위해 및/또는 새로운 특징을 도입하기 위해 새로운 버전의 펌웨어 및 소프트웨어가 주기적으로 발표된다. The new version of firmware and software are periodically released for order and / or to introduce a new feature to fix a bug. 전자 장치에서의 펌웨어 및/또는 소프트웨어 컴포넌트를 업데이트하는 데 이용되는 업데이트 프로그램, 코드, 또는 함수도 또한 변경, 수정 및/또는 업데이트될 필요가 있을 수 있다. FIG firmware and / or update the program, code, or function that is used to update the software components in an electronic device can also be changed, modified and / or needs to be updated. 프로그램은 업데이트 에이전트(update agent)를 이용하여 업데이트될 수 있다. The program can be updated by the update agent (update agent). 업데이트 에이전트는 펌웨어 및/또는 소프트웨어 중 하나를 업데이트하기 위한 소프트웨어를 포함할 수 있다. Update Agents may include software for updating one firmware and / or software. 전자 장치, 예를 들어 모바일 핸드셋에서의 업데이트 에이전트를 업데이트하는 것은 아주 어려운 일일 수 있다. The electronic device, for example, update your agent in the mobile handset may one day very difficult. 업데이트가 적절히 실행되지 않는 경우, 업데이트 에이전트는 동작 불능 상태가 될 수 있고 및/또는 손상될 수 있다. If the update is not properly executed, it updates the agent may be subject to the inoperable state and / or damage. 종래의 전통적인 방법의 다른 제한 및 단점은 이러한 시스템을, 도면을 참조 하여 본 출원 명세서의 나머지에 기술되어 있는 본 발명과 비교해보면 당업자에게는 명백하게 될 것이다. Other limitations and disadvantages of the prior art of a traditional method which with reference to the accompanying drawings such a system, is described in the remainder of this application specification comparison with the present invention will become apparent to those skilled in the art. 본 발명의 측면들은 모바일 전자 장치에서의 펌웨어 및 소프트웨어 중 하나를 업데이트하는 데 사용하기 위한 업데이트 상태 표시자에서 찾아볼 수 있다. Aspects of the present invention can be found in the updated status indicators to be used to update either firmware and software in the mobile electronic device. 업데이트 상태 표시자는 업데이트 주소 메모리 블록을 포함한다. The updated status will be updated to include the address of memory block. 이 업데이트 주소는 업데이트 소프트웨어가 전자 장치에서 어디에 저장되어 있는지를 식별해줄 수 있다. This update addresses that will be identified whether the software update is stored where in electronic devices. 업데이트 상태 표시자는 또한 전자 장치의 업데이트가 완료되었을 때 반환될 값을 포함하는 반환 메모리 블록, 및 복수의 상태 표시자를 포함하는 표시자 메모리 블록을 포함할 수 있다. The update status may also include returning the memory block, and the indicator block of memory, including the plurality of status that contains the value to be returned when the update of the electronic device is completed. 본 발명에 따른 실시예에서, 복수의 상태 표시자는 제1 버전의 소프트웨어를 제2 버전의 소프트웨어로 변환시키는 복수의 실행가능 명령어를 포함하는 업데이트 소프트웨어에 의해 이용될 수 있다. In the embodiment according to the present invention, The plurality of the status may be used by the update software comprises a plurality of executable instructions for converting a first version of the software with the second version of the software. 본 발명에 따른 실시예에서, 복수의 상태 표시자 중 적어도 하나는 전자 장치에 업데이트가 존재하고 또 업데이트가 수행되어야 함을 나타내기 위해 이용될 수 있다. In the embodiment according to the present invention, at least one of the plurality of status indicators may be used to indicate that an update exists on the electronic device, and should also update is to be performed. 본 발명에 따른 실시예에서, 복수의 상태 표시자 중 적어도 하나는 업데이트될 소프트웨어가 유효하고 업데이트될 수 있는지 여부를 나타내기 위해 이용될 수 있다. In the embodiment according to the present invention, at least one of the plurality of status indicators it may be used to indicate whether the software to be updated may be valid and updated. 본 발명에 따른 실시예에서, 복수의 상태 표시자 중 적어도 하나는 업데이트가 현재 업데이트될 소프트웨어 전체에 걸쳐 어느 패스(pass)를 수행하고 있는지를 나타내기 위해 이용될 수 있다. In the embodiment according to the present invention, at least one of the plurality of status indicators may be used to indicate that the update is performed which passes (pass) over the software to be updated currently. 본 발명에 따른 실시예에서, 복수의 상태 표시자 중 적어도 하나는 업데이트될 소프트웨어의 업데이트가 완료되었음을 나타내기 위해 이용될 수 있다. In the embodiment according to the present invention, at least one of the plurality of status indicators may be used to indicate that the update is complete, the software is updated. 본 발명의 측면들은, 제1 메모리 부분에 위치하는, 전자 장치를 부팅시키는 소프트웨어, 제2 메모리 부분에 위치하는, 전자 장치에서의 펌웨어 및 소프트웨어 중 하나를 업데이트시키는 업데이트 소프트웨어, 업데이트 이벤트 동안에 코드 및 정보 중 하나를 백업하는 데 사용가능한 예비 메모리 부분, 및 업데이트 이벤트 동안에 업데이트 소프트웨어에 의해 사용가능한 업데이트를 저장하는 적어도 하나의 부가 메모리 부분을 포함하는 모바일 전자 장치의 메모리 구성에서 찾아볼 수 있다. Aspects of the present invention, the first memory section which is located in, software for booting the electronic device, the second update software, code, and information during the update event to the location in the memory section, updates one of the firmware and the software in an electronic device, during use of having available spare memory section, and the update event to back up one can be found in the memory configuration of the mobile electronic device comprising at least one additional portion of the memory that stores the available updates by the update software. 전자 장치에서의 소프트웨어 및 펌웨어 중 하나를 업데이트하는 단계는 소프트웨어 및 펌웨어 중 하나의 제1 버전을 소프트웨어 및 펌웨어 중 하나의 제2 버전으로 변환시키는 복수의 실행가능 명령어를 실행하는 단계를 포함할 수 있다. Updating one of software and firmware in an electronic apparatus may include a step of executing the software and a plurality of executable instructions for converting the one or the second version of the firmware to a first version of the software and firmware . 본 발명에 따른 실시예에서, 업데이트 소프트웨어는 장애 허용(fault tolerant) 방식으로 업데이트가능할 수 있다. In the embodiment according to the present invention, the update software may be updated to the fault-tolerant (fault tolerant) system. 본 발명에 따른 실시예에서, 메모리 구성은 비휘발성 메모리를 포함할 수 있다. In the embodiment according to the present invention, the memory arrangement may comprise a non-volatile memory. 본 발명에 따른 실시예에서, 소프트웨어 및 펌웨어는 메모리 구성에 압축된 형태로 저장되고 프로세싱 및 업데이트 중 하나를 위해 메모리 구성으로부터 랜덤 액세스 메모리로 압축 해제될 수 있다. In the embodiment according to the present invention, software and firmware it may be decompressed to the random access memory from the memory configuration for one of the stores in a compressed format and the processing and update the configuration memory. 본 발명의 측면들은 모바일 전자 장치에서의 소프트웨어 및 펌웨어 중 하나를 업데이트하는 데 이용가능한 업데이트 소프트웨어에서 찾아볼 수 있다. Aspects of the present invention can be found in the use of available software updates for updating one of the software and firmware on mobile electronic devices. 업데이트 소프트웨어는 소프트웨어 컴포넌트를 포함할 수 있다. Software updates may include software components. 이 소프트웨어 컴포넌트는 전자 장치에서의 업데이트될 소프트웨어 및 펌웨어 중 하나가 업데이트될 수 있는지를 판정하기 위해 소프트웨어 및 펌웨어 중 하나를 검사(survey) 및 검증(validate)하도록 구성될 수 있다. The software components may be configured to check (survey) and verify (validate) one of software and firmware to determine if one of the update the software and firmware in an electronic device can be updated. 이 소프트웨어 컴포넌트는 또한 업데이트 중단(update interruption)을 식별하도록 구성될 수 있다. The software components may also be configured to identify the updated stop (update interruption). 본 발명에 따른 실시예에서, 업데이트 중단을 식별하는 단계는 장애 허용 업데이트를 제공하고 또 중단된 업데이트가 그 중단이 일어난 곳에서 재개(re-initiate)될 수 있게 해줄 수 있다. In the embodiment according to the present invention, the step of identifying the update stop may allow the update give the provide the fault tolerant update, and also can be stopped (re-initiate) resume from where the interruption took place. 본 발명의 측면들은 모바일 전자 장치에서의 소프트웨어 및 펌웨어 중 하나를 업데이트하기 위해 업데이트 소프트웨어와 연계하여 이용가능한 업데이트 소프트웨어 래퍼(update software wrapper)에서 찾아볼 수 있다. Aspects of the present invention can be seen in conjunction with the update software available update software wrapper (wrapper software update) to update one of the software and the firmware of the mobile electronic device. 이 업데이트 소프트웨어 래퍼는 전자 장치 특정 소프트웨어와 애플리케이션 특정 소프트웨어 간의 상호작용을 용이하게 해주도록 구성될 수 있다. The update software wrapper may be configured to give to facilitate the interaction between the electronic device-specific software and application specific software. 본 발명에 따른 실시예에서, 전자 장치 특정 소프트웨어는 특정한 제조업자의 전자 장치 모델에서 동작하도록 구성된 소프트웨어를 포함할 수 있다. In the embodiment according to the present invention, an electronic device-specific software may include software configured to operate in the electronic device's model specific manufacturers. 본 발명에 따른 실시예에서, 애플리케이션 특정 소프트웨어는 특정한 제조업자의 전자 장치 모델과 무관한 특정 기능을 수행하도록 구성된 소프트웨어를 포함할 수 있다. In the embodiment according to the present invention, an application specific software may include software configured to perform a specific function independent of the model's particular electronic device manufacturing industry. 본 발명에 따른 실시예에서, 업데이트 소프트웨어 래퍼는 생성된 업데이트와 특정한 제조업자 전자 장치 모델의 펌웨어 및 소프트웨어 중 하나의 상호작용 및 인터페이싱을 가능하게 해주기 위해 제조업자 특정 전자 장치 모델 루트 코드(root code)와 제조업자 전자 장치 모델과 무관한 애플리케이션 특정 업데이트를 수행하도록 구성된 업데이트 정보를 결합시키는 소프트웨어를 더 포함할 수 있다. In the embodiment according to the present invention, the update software wrapper Manufacturer specific electronic device model root code to now enable one interaction and interfacing of the firmware and the software of the generated update to a particular manufacturer electronic device model (root code) and it may further include software that combines the updates is configured to perform an independent manufacturer of application-specific updates and electronics model. 본 발명에 따른 실시예에서, 이 업데이트 소프트웨어 래퍼는 메모리 모듈의 적어도 하나의 컴포넌트의 플래쉬 기입 함수(flash write function) 이전에 플래쉬 소거 함수(flash erase function)를 호출하도록 구성될 수 있다. In the embodiment according to the present invention, the update software wrapper may be configured to call the flash erase function (flash erase function) prior to at least one of a flash write function (flash write function) of the component on the memory module. 본 발명에 따른 실시예에서, 이 업데이트 소프트웨어 래퍼는 평가 설정(evaluation setting), 업데이트 변수 및 업데이트 함수(update function) 중 적어도 하나를 관리 및 조정하도록 구성될 수 있다. In the embodiment according to the present invention, the update software wrapper may be configured to manage at least one adjusting and setting of the evaluation (evaluation setting), and updates the variable update function (update function). 본 발명의 측면들은 비 장애 허용(non-fault-tolerant) 방식 및 장애 허용(fault-tolerant) 방식으로 모바일 전자 장치에 존재하는 업데이트 소프트웨어를 업데이트하도록 구성되어 있는 소프트웨어를 포함하는 모바일 전자 장치에서 찾아볼 수 있다. Aspects of the present invention found in a mobile electronic device comprising a non-fault-tolerant (non-fault-tolerant) system and a fault tolerant (fault-tolerant) is configured to how to update the update software on the mobile electronic device with software that can. 본 발명에 따른 실시예에서, 업데이트 소프트웨어를 장애 허용 방식으로 업데이트하는 단계는 업데이트 이벤트의 개시 이전에 업데이트 소프트웨어의 백업 복사본을 비휘발성 메모리에 저장하는 단계를 포함할 수 있다. In the embodiment according to the present invention, the step of updating the update software in fault tolerant manner may include the step of storing a backup copy of the updated software before the start of the update event to the non-volatile memory. 본 발명의 측면들은 비휘발성 메모리 구성에 저장된 적어도 2개의 프로그램 파일을 포함하는 모바일 전자 장치에서 찾아볼 수 있다. Aspect of the present invention may be found in a mobile electronic device comprising at least two program files are stored in non-volatile memory configuration. 적어도 2개의 프로그램 파일은 전자 장치를 부팅시키는 데 사용가능한 코드 및 데이터 중 적어도 하나를 포함할 수 있다. At least two program files may include at least one of the available codes and data used to boot the electronic device. 적어도 2개의 프로그램 파일은 업데이트될 소프트웨어의 상태에 따라 메모리 내의 서로 다른 장소로부터 관련 부팅 명령어를 호출하도록 구성될 수 있다. At least two of the program file may be configured to call the related boot instructions from a different location in the memory according to the state of the software is updated. 본 발명에 따른 실시예에서, 적어도 2개의 프로그램 파일은 바이너리 파일일 수 있다. In the embodiment according to the present invention, at least two of the program file may be a binary file. 본 발명에 따른 실시예에서, 적어도 2개의 프로그램 파일은 서로 다른 때에 부팅 동작을 수행하도록 구성될 수 있다. In the embodiment according to the present invention, at least two of the program file may be configured to each other perform the booting operation when the other. 본 발명에 따른 실시예에서, 적어도 2개의 프로그램 파일 중 하나는 비휘발성 메모리 내의 디폴트 시작 장소로부터 업데이트 소프트웨어를 부팅시키도록 구성될 수 있고, 적어도 2개의 프로그램 파일 중 다른 하나는 비휘발성 메모리 내의 예비 백업 장소로부터 업데이트 소프트웨어를 부팅시키도록 구성될 수 있다. In the embodiment according to the present invention, at least one of the two program files may be configured to reboot the update software from a default starting location in the non-volatile memory, the other of the at least two program files are redundant backup in non-volatile memory from which it can be configured to boot the updated software. 본 발명에 따른 실시예에서, 적어도 2개의 프로그램 파일 각각은 전자 장치에 존재하는 업데이트 소프트웨어의 장애 허용 업데이트의 개시 이전에 장애 허용을 제공하기 위해 디폴트 장소로부터 예비 백업 장소로 복사되는 부가의 재배치가능 코드 블록과 연관될 수 있다. In the embodiment according to the present invention, at least two program files, each of which exists in addition to be copied to the redundant backup location from the default location in order to provide fault tolerance before the start of the fault tolerant update of the update software relocatable code to the electronic device It may be associated with a block. 본 발명에 따른 실시예에서, 모바일 전자 장치는 전자 장치를 부팅시키는 소프트웨어를 더 포함할 수 있다. In the embodiment according to the present invention, the mobile electronic device may further comprise a software for booting the electronic device. 이 부팅시키는 소프트웨어는 부팅, 프로세싱 및 업데이트 중 하나를 위해 업데이트될 업데이트 소프트웨어 및 관련 재배치가능 코드 블록을 초기화하고 비휘발성 메모리 내의 스토리지로부터 랜덤 액세스 메모리로 재배치하기 위해 적어도 2개의 프로그램 파일 중 적어도 하나를 호출하도록 구성될 수 있다. Software for booting is called at least one of the at least two program files to initialize the boot processing and update software and associated relocatable code blocks to be updated to one of update and relocation to the random access memory from a storage in the non-volatile memory that may be configured. 본 발명의 이들 및 다른 이점, 측면 및 신규한 특징은 물론 본 발명의 예시적인 실시예의 상세는 이하의 설명 및 도면으로부터 보다 충분히 이해될 것이다. These and other advantages, aspects and novel features of the invention as well as details of an exemplary embodiment of the present invention will be more fully understood from the following description and drawings. 도 1은 본 발명의 실시예에 따라 전달 서버(delivery server)에 연결되어 통신하는 전자 장치를 포함하는 예시적인 프로비저닝 시스템(provisioning system)을 나타낸 블록도. Figure 1 is a block diagram illustrating an exemplary provisioning system (provisioning system) including the electronic device in communication are connected to the distribution server (delivery server) according to an embodiment of the invention. 도 2는 본 발명의 실시예에 따라 업데이트 패키지 주소, 표시자 블록, 반환 코드, 및 미사용/미지정 부분을 적어도 포함하는 예시적인 업데이트 상태 컴포넌트를 나타낸 블록도. Figure 2 is a block diagram showing an update package address, block marker, return code, and an exemplary update status component including an unused / unspecified part at least according to an embodiment of the invention. 도 3은 본 발명의 실시예에 따른 예시적인 전자 장치의 예시적인 메모리 구성을 나타낸 블록도. Figure 3 is a block diagram showing an example of memory configuration of an exemplary electronic device according to an embodiment of the invention. 도 4는 본 발명의 실시예에 따른 예시적인 전자 장치에서의 업데이트 에이전트의 예시적인 장애 허용(fault tolerant) 업데이트 방법을 나타낸 흐름도. Figure 4 is a flow diagram illustrating an exemplary example of a fault tolerant update agent in the electronic device updates (fault tolerant) method according to an embodiment of the invention. 도 5는 본 발명의 실시예에 따른 도 4에 도시된 예시적인 전자 장치에서의 업데이트 에이전트의 예시적인 장애 허용 업데이트 방법의 일부분을 나타낸 흐름도. Figure 5 is a flow diagram illustrating a portion of an exemplary update method of a fault tolerant update agent in the exemplary electronic device illustrated in Figure 4 according to an embodiment of the invention. 도 6은 본 발명의 실시예에 따른 예시적인 전자 장치에서의 업데이트 에이전트의 예시적인 3-단계 업데이트 방법을 나타낸 흐름도. 6 is a flowchart outlining an exemplary 3-phase update process of updating the agent in an exemplary electronic device according to an embodiment of the invention. 도 7은 본 발명의 실시예에 따른 예시적인 전자 장치에 대한 예시적인 메모리 구성을 나타낸 블록도. Figure 7 is a block diagram illustrating an exemplary memory configuration for an exemplary electronic device according to an embodiment of the invention. 도 8은 본 발명의 실시예에 따른 예시적인 전자 장치에 대한 예시적인 메모리 구성을 나타낸 블록도. Figure 8 is a block diagram showing an exemplary memory configuration for an exemplary electronic device according to an embodiment of the invention. 도 9는 본 발명의 실시예에 따른 예시적인 전자 장치에 대한 예시적인 메모리 구성을 나타낸 블록도. Figure 9 is a block diagram showing an exemplary memory configuration for an exemplary electronic device according to an embodiment of the invention. 전자 장치는 전자 장치를 업데이트하기 위한 업데이트 정보를 검색하기 위해 서버에 액세스하도록 구성될 수 있다. The electronic device may be configured to access the server to retrieve update information for updating electronic devices. 전자 장치는 예를 들어 모바일 셀룰러 전화 핸드셋, 개인 휴대 단말기(PDA), 페이저, MP3 플레이어, 디지털 카메라, 기타 등등의 소프트웨어/펌웨어를 갖는 모바일 전자 장치일 수 있다. The electronic device may be a mobile electronic device having a for example a mobile cellular telephone handset, personal digital assistant (PDA), a pager, a software / firmware of MP3 players, digital cameras, and the like. 업데이트 정보는 모바일 전자 장치에 설치된 펌웨어 및/또는 소프트웨어 컴포넌트를 수정, 변환 또는 변경하는 정보를 포함할 수 있다. Update information may include information for modifying, converting or changing the firmware and / or software components installed on the mobile electronic device. 업데이트 정보는 또한 서비스 제공업자, 장치 제조업자 또는 최종-사용자가 원하는 바에 따라, 모바일 전자 장치에 새로운 서비스를 부가할 수 있다. Updated information is also service providers, equipment manufacturers and end-users can, as desired, add a new service for mobile electronic devices. 업데이트 정보는 또한 모바일 전자 장치에 설치된 다른 펌웨어 및/또는 소프트웨어 컴포넌트에 대한 업데이트를 수행할 수 있는 소프트웨어를 수정, 변환 또는 변경하는 정보를 포함할 수 있다. Update information may also include information for modifying, converting or changing the software that can perform an update to other firmware and / or software components installed on the mobile electronic device. 본 발명의 측면들은 소프트웨어 및/또는 펌웨어의 장애 허용 업데이트 방법에서 찾아볼 수 있다. Aspects of the present invention can be found in the fault-tolerant how to update the software and / or firmware. 소프트웨어 및/또는 펌웨어는 비휘발성 메모리 장치, 예를 들어 플래쉬 메모리 장치에 압축된 형태로 저장될 수 있다. Software and / or firmware may be stored in compressed form in a nonvolatile memory device, such as a flash memory device. 소프트웨어 및/또는 펌웨어는 프로그램 명령어, 코드, 정보 및/또는 데이터를 포함할 수 있다. Software and / or firmware may include program instructions, code, information and / or data. 비휘발성 메모리는 재프로그래밍 이전에 소거될 수 있다. Non-volatile memory may be erased prior to reprogramming. 본 발명에 따른 다른 실시예에서, 비휘발성 메모리는 업데이트 및/또는 재프로그래밍 동안에 소거되거나 소거되지 않은 상태에서 덮어쓰기될 수 있다. In another embodiment according to the present invention, the non-volatile memory can be overwritten in a state that is not erased or updated during the erasure and / or reprogramming. 본 발명에 따른 실시예에서, 소프트웨어 및/또는 펌웨어의 장애 허용 업데이트 방법은 업데이트 및/또는 재프로그래밍 이벤트 동안에 정전 사고(power failure)가 발생하는 경우에 정보의 손실을 방지하는 단계를 포함할 수 있다. In an embodiment according to the present invention, software and / or fault tolerant update of firmware, the method may include the step of preventing loss of information if a power outage (power failure) while updating and / or re-programmed event occurs, . 본 발명에 따른 실시예에서, 소프트웨어 및/또는 펌웨어의 장애 허용 업데이트 방법은 업데이트 및/또는 재프로그래밍 절차 동안에 정전 사고(power failure)가 발생하는 경우에 업데이트 및/또는 재프로그래밍 절차의 연속성을 보장하는 단계를 포함할 수 있다. In the embodiment according to the present invention, software and / or fault tolerant updates of firmware method to ensure the continuity of updating and / or re-programming procedure in the case where the incident power failure during update and / or re-programming procedure (power failure) occurs It can include. 본 발명에 따른 실시예에서, 소프트웨어 및/또는 펌웨어의 장애 허용 업데이트 방법은 업데이트 및/또는 재프로그래밍 이벤트 동안에 정전 사고(power failure)가 발생하는 경우에 소프트웨어 및/또는 펌웨어의 손상 및/또는 무효화를 방지하는 단계를 포함할 수 있다. In an embodiment according to the present invention, software and / or the fault-tolerant update process of the firmware is updated and / or re-programming event outages (power failure) is if the software and / or damage and / or disabling of the firmware on which occur during It can include prevention. 본 발명에 따른 실시예에서, 전자 장치에서의 업데이트될 소프트웨어 및/또는 펌웨어는 프로그램 코드 및/또는 데이터를 포함할 수 있다. In the embodiment according to the present invention, software and / or firmware to be updated from the electronic device may include a program code and / or data. 프로그램 코드 및/또는 데이터는 유닛 또는 블록으로 구성/배열될 수 있다. Program code and / or data may be configured / arranged in a unit or a block. 블록은 또한 본 명세서에서 뱅크, 압축된 유닛/블록, 및 압축 해제된 유닛/블록이라고도 칭해질 수 있다. Blocks may also be referred to as a bank in the present specification, a compression unit / block, and the unit / block extracted. 본 발명에 따른 실시예에서, 업데이트 패키지 생성자(update package generator)는 전자 장치에서의 펌웨어 및/또는 소프트웨어 중 하나를 업데이트하는 데 사용하기 위한 복수의 업데이트 유닛/블록을 포함하는 업데이트 패키지를 생성하도록 구성될 수 있다. In the embodiment according to the present invention, the update package generator (update package generator) is configured to generate an update package including a plurality of update unit / block to be used to update one of firmware and / or software in an electronic device, It can be. 업데이트 블록/유닛은 정보 및/또는 업데이트될 정보의 블록을 업데이트하는 데 사용가능한 실행가능 프로그램 명령어를 포함하는 블록으로서 정의될 수 있다. Update blocks / units may be defined as information and / or used to update a block of information to be updated block containing an available-executable program instructions. 업데이트(업데이트 패키지)는 특정한 펌웨어/소프트웨어 버전을 수정 또는 변경하는 데, 예를 들어 보다 새로운 버전으로 업그레이드하는 데 사용될 수 있는 펌웨어/소프트웨어 업데이트를 포함할 수 있다. Update (Update package) can include a specific firmware / software to modify or change the version, for example, than the firmware / software update that can be used to upgrade to the new version. 펌웨어 및/또는 소프트웨어를 업데이트하는 데 사용되는 업데이트 소프트웨어(업데이트 에이전트)는 전자 장치에 저장되어 있을 수 있다. The firmware and / or software update (update agent) is used to update the software can be stored in the electronic device. 업데이트 소프트웨어는 본 명세서에서 업데이트 에이전트라고도 칭해질 수 있다. Updating the software may be referred to as an Update Agent herein. 업데이트 에이전트는 또한 업데이트 패키지 생성자에서 생성된 업데이트(업데이트 패키지)에 의해서도 업데이트될 수 있다. Update agent may also be updated by the update (update package) generating from the update package generator. 본 발명에 따른 실시예에서, 업데이트 패키지는 예를 들어 제1 버전의 펌웨어/소프트웨어("코드")를 제2 버전의 코드로 변환하기 위한 일련의 실행가능 명령어를 포함할 수 있다. In the embodiment according to the present invention, the update package may include, for example, a series of executable instructions for converting a firmware / software ( "code") of the first version to the second code version. 본 발명에 따른 실시예에서, 업데이트 패키지는 또한 서비스 제공업자 또는 최종 사용자가 원하는 바에 따라, 새로운 서비스를 전자 장치에 부가하거나 서비스를 삭제할 수 있다. In the embodiment according to the present invention, the update package is also, as a service provider or the end user desired, can be deleted or added service a new service to the electronic device. 업데이트 패키지는 또한 본 명세서에서 축약된 형태로 업데이트라고도 칭해질 수 있다. Update package may also be referred to as updates in abbreviated form in the specification. 모바일 전자 장치에서의 펌웨어/소프트웨어 중 하나를 업데이트하는 것은 일련의 실행가능 명령어를 수행하여 제1 버전의 펌웨어/소프트웨어("코드")를 제2 버전의 코드로 변환하는 단계를 포함할 수 있다. Updating the one of the firmware / software in the mobile electronic device may include the step of performing a set of executable instructions, converts the first firmware / software ( "code") of the version of the second version of the code. 본 발명에 따른 실시예에서, 복수의 전자 장치를 지원하도록 구성된 전자 장치 네트워크는 업데이트 패키지 생성자를 포함할 수 있다. In the embodiment according to the present invention, an electronic apparatus network is configured to support a plurality of electronic device may include an update package generator. 업데이트 패키지 생성자는 복수의 업데이트 유닛/블록을 포함하는 업데이트(업데이트 패키지)를 생성하도록 구성되어 있을 수 있다. Update package generator may be configured to generate an update (Update Package) including a plurality of update unit / block. 업데이트 유닛/블록은 제1 버전의 펌웨어/소프트웨어("코드")를 제2 버전의 코드로 변환하기 위한 일련의 실행가능 명령어를 포함할 수 있다. Update unit / block may include a series of executable instructions for converting a first version of the firmware / software ( "code") to the second code version. 본 발명에 따른 실시예에서, 업데이트 패키지를 생성하는 단계는 기존의/이전의 업데이트 패키지에 존재하는 정보/코드를 새로운 또는 다른(업데이트된) 정보로 덮어쓰기하는 단계를 포함할 수 있다. In the embodiment according to the present invention, the step of generating the update package may comprise the step of overwriting the information / code present in the existing / older update package with a new or different (updated) information. 예를 들어, 복수의 실행가능 프로그램 명령어를 포함하는 업데이트 패키지는 모바일 전자 장치에서의 펌웨어를, 예를 들어 펌웨어 버전 2에서 펌웨어 버전 3으로 업데이트하기 위해 이전에 생성(및 이용)되었을 수 있다. For example, the update package that includes a plurality of executable program instructions may have been the firmware in the mobile electronic device, such as a previously generated in order to update the firmware in the firmware version 2 version 3 (and use). 이 업데이트는 예를 들어 업데이트 2-3이라고 부를 수 있다. This update may be called update 2-3, for example. 예를 들어, 전자 장치에서의 펌웨어를 펌웨어 버전 3에서 펌웨어 버전 4로 업데이트(업데이트 3-4)하기 위한 업데이트 패키지를 생성하기 위해서는, 이전의 업데이트 패키지(업데이트 2-3)는 전자 장치에서의 펌웨어를 펌웨어 버전 3에서 펌웨어 버전 4로 업데이트(업데이트 3-4)하기 위한 업데이트 패키지를 경제적으로 생성하기 위해 수정될 수 있다(실행가능 명령어/코드/데이터가 부가, 삭제 및/또는 덮어쓰기될 수 있다). For example, to generate an update package for updating the firmware of the electronic device from the firmware version 3 to firmware version 4 (Update 3-4), firmware in the previous update package (updated 2-3) The electronic device a firmware update in the version 3 in firmware version 4 can be modified to economically produce the update package to (updated 3-4) (executable instructions / code / data that may be a letter added, deleted and / or overwritten ). 이와 같이, 업데이트 패키지 생성자는 완전히 새로운 업데이트 패키지를 생성할 필요가 없을 수 있으며, 오히려 업데이트 생성자는 적어도 어떤 새로운/다른 실행가능 명령어를 사용하여 이전의 업데이트 패키지를 재활용하도록 구성될 수 있다. Thus, the update package constructors may not be necessary to completely create a new update package, rather than updating the constructor can be configured to recycle the previous update package using at least some new / different executable instructions. 본 발명에 따른 실시예에서, 업데이트를 생성하는 단계는 새로운 업데이트 패키지를 생성하는 정보/코드를 메모리에 기입 및 구성하는 단계를 포함할 수 있다. In the embodiment according to the present invention, the method comprising: generating an update may include the step of writing and configuration information / code for generating a new updated package in the memory. 업데이트 패키지는 복수의 업데이트 정보 블록을 사용하여 작성될 수 있다. Update package can be built using a plurality of block update information. 본 발명에 따른 실시예에서, 전자 장치 네트워크에서의 업데이트 패키지 생성자에 의해 생성된 업데이트(업데이트 패키지)는 업데이트될 펌웨어/소프트웨어를 갖는 복수의 전자 장치로 전송하기 위해 압축될 수 있다. In the embodiment according to the present invention, the update generated by the update package generator in an electronic device, the network (update package) can be compressed for transmission to a plurality of electronic apparatus having the firmware / software is updated. 압축된 업데이트 패키지는 또한 전자 장치에서 수신된 후에 압축 해제될 수 있다. Compressed update package may also be decompressed after being received by the electronic device. 도 1은 본 발명의 실시예에 따른 전자 장치, 예를 들어 모바일 핸드셋(107)을 포함하는 예시적인 프로비저닝 시스템(provisioning system)(105)을 나타낸 블록도이다. 1 is a block diagram showing the electronic apparatus, for example, an exemplary provisioning system (provisioning system) comprising a mobile handset 107, 105 according to the embodiment of the present invention. 전자 장치, 예를 들어 모바일 핸드셋(107)은 통신 링크(177)를 통해 전자 장치 네트워크 내의 전달 서버(delivery server)(127)에 통신 연결될 수 있다. Electronic devices, such as mobile handset 107 may be connected to the communication transmission server (delivery server) (127) in the electronic device via a network communication link (177). 통신 링크(177)는 유선 또는 무선 통신 링크 중 하나일 수 있다. Communication link 177 may be either wired or wireless communication link. 본 발명에 따른 실시예에서, 전달 서버(127)는 전자 장치로부터 원격지에 있는 무선/캐리어 전자 장치 네트워크에 배치되어 있을 수 있다. In the embodiment according to the present invention, the delivery server 127 may be arranged on the wireless / electronic device carrier network at a remote location from the electronic device. 전달 서버(127)는 또한 통신 링크(167)를 통해 업데이트 스토어(update store)(129)에 통신 연결되어 있을 수 있다. The delivery server 127 may also be communicatively coupled to update the store (update store) (129) over a communication link (167). 통신 링크(167)는 유선 또는 무선 통신 링크 중 하나일 수 있다. Communication link 167 may be either wired or wireless communication link. 업데이트 스토어(129)는 업데이트 패키지 생성자(131)에 의해 생성된 업데이트 패키지의 저장소일 수 있다. Update store 129 may be a repository of the update package generated by the update package generator 131. 업데이트 스토어(129)는 또한 통신 링크(169)를 통해 업데이트 패키지 생성자(131)에 통신 연결되어 있을 수 있다. Update store 129 may also be communicatively coupled to the update package generator 131 via a communication link (169). 통신 링크(169)는 유선 또는 무선 통신 링크 중 하나일 수 있다. Communication link 169 may be either wired or wireless communication link. 본 발명에 따른 실시예에서, 전자 장치, 예를 들어 모바일 핸드셋(107)은 비휘발성 메모리(NVM)(109) 및 펌웨어 관리자(159)를 포함할 수 있다. In the embodiment according to the present invention, an electronic apparatus, for example, the mobile handset 107 may include a non-volatile memory (NVM) (109) and firmware manager 159. NVM(109)는 예를 들어, 부트 로더(boot loader)(111), 업데이트 에이전트(113), 펌웨어(117), 오퍼레이팅 시스템(OS)(119), 전자 장치 애플리케이션(121) 및 업데이트 패키지(123)를 포함할 수 있다. NVM (109), for example, a boot loader (boot loader) (111), update agent 113, firmware 117, an operating system (OS) (119), the electronic device application 121, and the update package (123 ) may include. 업데이트 에이전트(113)는 업데이트 패키지(123)를 이용함으로써 예를 들어, 전자 장치, 예를 들어 모바일 핸드셋(117)의 펌웨어(117), 오퍼레이팅 시스템(119), 및/또는 전자 장치 애플리케이션(121) 중 적어도 하나를 업데이트하기 위한 소프트웨어를 포함할 수 있다. Update agent 113, for example, an electronic apparatus, for example, firmware 117, an operating system 119, and / or electronic device application 121 of the mobile handset (117) by using the update package 123 one may include software for updating at least one. 본 발명에 따른 실시예에서, 업데이트 에이전트(113)도 역시 업데이트될 수 있다. In the embodiment according to the present invention, the update agent 113 may also be updated. 전자 장치 네트워크에서의 업데이트 패키지 생성자(131)는 또한 업데이트 에이전트(113)를 업데이트하는 데 사용하기 위한 업데이트 패키지, 예를 들어 업데이트 패키지(123)를 생성하도록 구성되어 있을 수 있다. Update package in electronics network generator 131 may also be configured to contain an update package, for generating an update package (123) for use in updating the update agent 113. 본 발명에 따른 실시예에서, 업데이트 에이전트(113)는 펌웨어(117), 오퍼레이팅 시스템(119) 및/또는 전자 장치 애플리케이션(121)을 업데이트하기 위해 랜덤 액세스 메모리(RAM) 장치(125)를 임시 업데이트 스토리지/프로세싱 메모리로서 이용하도록 구성되어 있을 수 있다. In the embodiment according to the present invention, the update agent 113 is a temporary firmware 117, an operating system 119 and / or electronic device applications 121, a random access memory (RAM) device 125 to update the update It can be configured to use as a storage / processing memory. RAM(125)은 또한 업데이트 에이전트(113)의 업데이트 동안에 임시 업데이트 스토리지/프로세싱 메모리로서 사용될 수 있다. RAM (125) it can also be used as a temporary storage updating / processing memory during the updating of the update agent 113. 업데이트 에이전트(113)는 펌웨어(117), 오퍼레이팅 시스템(119) 및/또는 전자 장치 애플리케이션(121)을 장애-허용(fault-tolerant) 방식으로 업데이트하도록 구성되 어 있을 수 있다. Update agent 113 has firmware 117, an operating system 119 and / or electronics failure the application 121 - may be it is configured to update the allowed (fault-tolerant) system. 본 발명에 따른 실시예에서, 업데이트 에이전트(113)도 역시 장애 허용 방식으로 업데이트될 수 있다. In the embodiment according to the present invention, the update agent 113 also may also be updated to the fault-tolerant system. 본 발명에 따른 실시예에서, 부트 로더(111)는 예를 들어, 시동 또는 재부팅 동안에 실행될 수 있다. In the embodiment according to the present invention, the boot loader 111 is, for example, may be performed during the start-up or reboot. 부트 로더(111)는 업데이트 에이전트(113)를 실행할지 여부를 판정할 수 있다. The boot loader 111 may determine whether to execute the update agent 113. 부트 로더(111)는 또한 업데이트 패키지, 예를 들어 업데이트 패키지(123)가 존재하는지 여부 및 펌웨어(117), OS(119), 전자 장치 애플리케이션(121), 및/또는 업데이트 에이전트(113) 중 하나의 업데이트가 수행되어야 하는지 여부를 판정할 수 있다. One that the boot loader 111 may also update package, such as the update package 123, the presence and firmware (117), OS (119), the electronic device application 121, and / or update agent 113 for it is possible to determine whether the update is to be performed. 본 발명에 따른 실시예에서, 업데이트 에이전트(113)를 실행할지 여부를 판정하는 일은 예를 들어 부트 로더(111)가 생성된 업데이트 패키지, 예를 들어 업데이트 패키지(123)와 연관된 적어도 하나의 상태 플래그/표시자에 액세스하여 이를 평가함으로써 용이하게 될 수 있다. In the embodiment according to the present invention, to determine whether to execute the update agent 113 days, for example a boot loader 111, the generated update package, such as the update package 123 is associated with at least one status flag / access to the indicator can be facilitated by evaluating them. 본 발명에 따른 실시예에서, 상태 플래그/표시자는 또한 업데이트 에이전트(113)가 업데이트되어야 하는지 여부를 판정하기 위해 부트 로더(111)에 의해 평가될 수 있다. The embodiment in accordance with the present invention, the status flag / display can also be evaluated by a boot loader (111) to determine whether the update agent 113 needs to be updated. 업데이트가 행해져야 하는 경우, 부트 로더(111)는 예를 들어 업데이트 에이전트(113)가 유효하고 업데이트를 수행하기 위해 사용가능한지 또는 손상되고 업데이트를 수행할 수 없는지를 판정하기 위해 업데이트 에이전트(113)를 평가할 수 있다. If you need the update is performed, the boot loader 111 is the update agent 113 to determine that there e.g. update agent 113 can be available and is enabled to perform the update, or damaged, and performs the update It can be evaluated. 본 발명에 따른 실시예에서, 업데이트 에이전트(113)를 실행해야 하는지 여부는 예를 들어 순환 중복 검사(CRC) 및/또는 체크섬(checksum)을 계산하고 평가함으로써 부트 로더(111)에 의해 판정될 수 있다. Whether in an embodiment according to the present invention, the need to run the update agent 113, for example, cyclic redundancy check (CRC) and / or a checksum (checksum) for by calculating and evaluating can be determined by the boot loader 111 have. CRC 및/또는 체크섬은 부트 로더 (111)에 의해 이전에 계산된 기준값과 비교될 수 있다. CRC and / or a checksum may be compared with a reference value previously calculated by the boot loader (111). 본 발명에 따른 실시예에서, 업데이트 에이전트, 예를 들어 업데이트 에이전트(113)의 업데이트 동안에, 업데이트 절차가 중단된 경우, 업데이트 에이전트(113)는 부분적인 업데이트의 상태에 남겨져 있을 수 있다. In the embodiment according to the present invention, during the update of the update agent, for example, update agent 113, it may be when the update process is interrupted, update agent 113 is left in the state of a partial update. 부분적으로 업데이트된 업데이트 에이전트는 사용가능하지 않고, 동작 불능이며, 및/또는 손상되어 있을 수 있다. The partially updated, the update agent may be not available, an inoperable, and / or damaged. 업데이트 에이전트, 예를 들어 업데이트 에이전트(113)를 동작불능 상태가 되게 하는 것 및/또는 손상시키는 것을 피하기 위해, 업데이트 절차의 개시/수행 이전에 업데이트될 업데이트 에이전트(113)의 백업 복사본이 생성되어, NVM(109)에 저장 및 유지될 수 있다. In order to avoid that is to be the update agent, for example, inability to operate the update agent 113, state and / or damage, the backup copy of the update agent 113 will be updated prior to the start of the update procedure / performed is generated, It may be stored and held in the NVM (109). 상태 플래그/표시자는 또한 업데이트 에이전트의 업데이트가 부분적으로 완료되었음을 부트 로더(111)에 경보/통지하는 데 사용될 수 있고 또한 예를 들어 업데이트가 어디에서 중단되었는지를 나타낼 수 있다. The state flag / display can also indicate whether the update agent updates that are partially completed and can be used to alert / notification to the boot loader (111) In addition, for example, the update is interrupted and where. 본 발명에 따른 실시예에서는, 따라서 업데이트 에이전트의 장애 허용(복구가능) 업데이트가 보장될 수 있다. In the embodiment according to the present invention, therefore, there is a fault tolerant (recovery only) update of the update agent can be assured. 업데이트 중인 업데이트 에이전트, 예를 들어 업데이트 에이전트(113)가 업데이트 절차 동안에 장애로 인해 동작불능 상태로 되거나 손상된 경우, 업데이트 에이전트의 수정되지 않은(원래의) 백업 복사본이 메모리, 예를 들어 NVM(109)으로부터 복원될 수 있으며, 여기서 업데이트는 예를 들어 업데이트가 중단된 곳에서 차후에 재개될 수 있다. If you are updating Update Agents, for example, update agent 113 with inoperable state due to a failure during the update process, or damaged, the unmodified (original) backup copy of the Update Agent for memory, for example, NVM (109) It can be recovered from, and where updates can be resumed at a later date, for example where the update is interrupted. 재부팅 또는 시동 동안에 부분적으로 업데이트된 또는 부적절하게 업데이트된 업데이트 에이전트가 손상되어 있음 및/또는 동작 불능인 경우, NVM(109)에 저장되어 있는 업데이트 에이전트의 백업 복사본이 부트 로더(111)에 의해 호출될 수 있고, 업데이트 절차가 재개/재실행될 수 있다. If a reboot or a partially updated to the updated or improper update agent is damage that and / or operate out during the start-up, the backup copy of the update agent stored in NVM (109) to be called by the boot loader 111 can and may update procedure may resume / redo. 상태 플래그/표시자는 또한 업데이트 에이전트, 예를 들어 업데이트 에이전트(113)가 손상되어 있음 및/또는 동작 불능 상태임을 부트 로더(111)에 경보/통지하는 데 사용될 수 있다. The state flag / indication also update agent, for example, update agent 113 may be used to alert / notification on the available and / or the boot loader 111 that the action disabled damage. 본 발명에 따른 실시예에서, 부트 로더(111)는 현재의 업데이트 에이전트(113)가 호출되어야 하는지 여부(디폴트 부트스트래핑(default bootstrapping)), 업데이트 에이전트가 업데이트되어야 하는지 여부, 또는 NVM(109) 내의 업데이트 에이전트(113)의 백업 버전이 호출되어야 하는지 여부를 판정하도록 구성되어 있을 수 있다. In an embodiment according to the present invention, the boot loader 111 is whether the current update agent 113 is to be called (the default bootstrapping (default bootstrapping)), updating whether the agent is to be updated, or NVM (109) It may be configured to determine whether or not the call is to be backed up versions of the update agent 113. 이 판정은 상태 정보(상태 플래그/표시자), 예를 들어 업데이트가 수행해져야 하는지 여부 및/또는 업데이트 없는 통상의 시동 동작이 수행되어야 하는지 여부에 기초하여 행해질 수 있다. This determination is the status information (status flags / markers), for example, be made based on whether and / or the start of the normal operation to be performed if no update haejyeoya update is performed. 본 발명에 따른 실시예에서, 전자 장치는 또한 업데이트 패키지, 예를 들어 업데이트 패키지(123)가 전달 서버(127)로부터 전자 장치로 다운로드된 후의 상태 정보(상태 플래그/표시자) 및 메모리 장소 주소의 설정을 용이하게 해줄 수 있는 핸드오프 에이전트(166)를 포함할 수 있다. In the embodiment according to the invention, the electronic device may also update package, such as the update package 123, the distribution server state information (state flag / indicator) after it has been downloaded to the electronic device from the (127) and a memory location address set may comprise a handoff agent 166 who can facilitate. 본 발명에 따른 실시예에서, 전자 장치는 또한 다운로드 에이전트(196)를 포함할 수 있다. In the embodiment according to the present invention, the electronic device may also include a download agent 196. 다운로드 에이전트(196)는 업데이트 패키지, 예를 들어 업데이트 패키지(123)의 다운로드를 용이하게 해줄 수 있다. Download agent 196 may be that will facilitate the downloading of the update package 123, for the update package, e.
도 2는 예시적인 업데이트 상태 표시자(205)를 나타낸 블록도이다. 2 is a block diagram showing an exemplary update status indicator (205). 업데이트 상태 표시자(205)는 예를 들어 도 1에 도시한 NVM(109) 등의 비휘발성 메모리에 저장될 수 있다. Update status indicator 205 may be stored in non-volatile memory such as a NVM (109) shown in Figure 1, for example. 업데이트 상태 표시자는 업데이트 패키지에 부속되어 있고 및/또는 전자 장치로 다운로드되는 생성된 업데이트 패키지의 일부일 수 있다. The status update may be a part of the update package generation, and is downloaded to and / or electronic accessories in the update package. 업데이트 상태 표시자(205)는 예를 들어 32 바이트 길이일 수 있다. Update status indicator 205 may, for example, 32 bytes long. 업데이트 상태 표시자(205)는 업데이트 패키지 주소(209), 표시자 블록(215), 반환 코드(213), 및 미사용/미지정 부분(211)을 적어도 포함할 수 있다. Update status indicator 205 may include the address update package 209, a block marker 215, the return code (213), and unused / unspecified portion 211 at least. 업데이트 패키지 주소(209)는 예를 들어 4 바이트 길이일 수 있다. Address update package 209 may be, for example, 4 bytes long. 표시자 블록(215)은 예를 들어 4 바이트 길이일 수 있다. Marker block 215 can be, for example, 4 bytes long. 반환 코드도 역시 예를 들어 4 바이트 길이일 수 있다. The return code can also be one, too, for example a 4-byte length. 업데이트 상태 표시자(205)의 표시자 블록(215)은 업데이트가 수행되어야 하는지 여부, 업데이트가 부분적으로 완료되어 있는지 여부, 업데이트 에이전트가 손상되어 있는지 여부, 기타 등등을 판정하기 위해 부트 로더(111)에 의해 평가될 수 있는 복수의 상태 플래그/표시자를 포함할 수 있다. Marker block 215, the update status indicator 205 includes a boot loader 111 to determine the status, so that it is, whether the update has been partially completed, whether or not, updating the agent is corrupted is the that the update is to be performed the evaluation may contain a plurality of status flag / display, which may be by. 본 발명에 따른 실시예에서, 업데이트 에이전트, 예를 들어 도 1에 도시된 업데이트 에이전트(113)는 업데이트 패키지, 예를 들어 업데이트 패키지(123)를 검색하기 위해 업데이트 패키지 주소(209)를 이용할 수 있다. In the embodiment according to the present invention, the update agent, for example, the update agent 113 shown in Figure 1 may utilize the update package addresses 209 to retrieve the update package 123, for the update package, such as . 검색된 업데이트 패키지(123)는 펌웨어(117), 오퍼레이팅 시스템(119) 및/또는 애플리케이션(121)을 업데이트하는 데 이용될 수 있다. Retrieved update package 123 may be used to update the firmware (117), an operating system 119 and / or the application 121. 검색된 업데이트 패키지(123)는 또한 도 1에 도시한 업데이트 에이전트(113)를 업데이트하는 데 이용될 수 있다. Retrieved update package 123 can also be used to update the update agent 113 shown in FIG. 본 발명에 따른 실시예에서, 표시자 블록(215)은 복수의 상태 플래그/표시자, 예를 들어 b 0 , b 1 , b 2 , 및 b 3 를 포함할 수 있다. In the embodiment according to the present invention, the indicator block 215 may comprise a plurality of status flags / markers, such as b 0, b 1, b 2 , and b 3. 표시자 블록(215)에서의 예시 적인 표시자(b 0 , b 1 , b 2 , 및 b 3 )는 예를 들어 업데이트 에이전트(113)의 호출을 제어하기 위해 부트 로더에 의해 이용될 수 있다. An exemplary display of the indicator block 215 characters (b 0, b 1, b 2, and b 3), for example, may be used by the boot loader to control the call of the update agent 113. 플래그, 주소, 표시자, 보안 정보, 및 부가의 장치 상태 정보는 또한 대응하는 펌웨어, 소프트웨어, 하드웨어, 및 다른 코드/데이터/정보와 연관된 기능의 상태를 표시하기 위해 업데이트 상태 표시자(205)에서 이용될 수 있다. Flag, address, indicator, security information, and add the device status information also corresponding firmware, software, in hardware, and other code / data / information and update status indicator 205 to indicate the status of the associated function It can be used. 본 발명에 따른 예시적인 실시예에서, 예시적인 표시자(b 0 , b 1 , b 2 , 및 b 3 )는 예를 들어 이하의 예시적인 정의를 제공받을 수 있다. In an exemplary embodiment according to the present invention, an exemplary indicator (b 0, b 1, b 2, and b 3) may be provided with an exemplary definition of the following, for example. 본 발명에 따른 실시예에서, 표시자 b 0 는 예를 들어 업데이트 표시자를 포함할 수 있다. In the embodiment according to the present invention, the indicator b 0 may contain a display update for instance. 표시자 b 0 는 핸드오프 에이전트, 예를 들어 도 1에 도시된 핸드오프 에이전트(166)에 의해 설정될 수 있다. Indicator b 0 may be set by a hand-off agent 166 shown in Figure 1 contains a hand-off agents, for example. 표시자 b 0 는 업데이트 패키지(123)가 존재하고 또 업데이트가 수행되어야 함을 나타내기 위해 0으로 설정될 수 있다. Indicator b 0 may be set to 0 to indicate that it should be updated packages (123) exists, and updates are performed again. 표시자 b 0 에 대한 디폴트/초기 값은 예를 들어 1일 수 있다. The default / initial value for the indicator b 0 may be one days, for example. 본 발명에 따른 실시예에서, 표시자 b 1 은 예를 들어 검증 단계 표시자(validation phase indicator)를 포함할 수 있다. In the embodiment according to the present invention, the indicator b 1, for example, may include a verification phase indicator (validation phase indicator). 검증 단계가 완료된 경우, 표시자 b 1 의 값은 복수의 장치 래퍼(device wrapper)에서 0으로 설정될 수 있다. If the verification step has been completed, the value of the indicator b 1 may be set to 0 in the (device wrapper) a plurality of wrapper apparatus. 표시자 b 1 에 대한 디폴트/초기 값은 예를 들어 1일 수 있다. The default / initial value for the indicator b 1 may be one days, for example. 장치 래퍼는 일반 소프트웨어가 특정한 버전의 소프트웨어와 상호작용할 수 있게 해주도록 구성되어 있는 소프트웨어 인터페이스를 포함할 수 있다. Device wrapper may include a software interface that is configured which enables the general software can interact with a particular version of software. 예를 들어, 전자 장치 제조업자 각각은 대응하는 전자 장치 모델 내에 독자적인 특정한 펌웨어를 제공할 수 있다. For example, each electronic device manufacturers may provide their own specific firmware in the electronic device models that support. 전자 장치 업데이트 생성 회사는 제조업자의 전자 장치 내에 제공되어 있는 독점적 또는 루트 코드(proprietary or root code)를 제공받지 않을 수 있다. Electronic Device Update generating company can not be provided exclusively or root code that is provided in the electronics manufacturing industry's (proprietary or root code). 전자 장치 업데이트 생성 회사는 제조업자, 예를 들어 업데이트 에이전트에 상관없이 임의의 전자 장치에 대한 특정 업데이트를 수행하도록 구성되어 있는 일반 업데이트 패키지를 생성할 수 있다. Electronic devices generate update company may generate a normal update package that is configured to perform a specific update for any electronic device, regardless of the manufacturer of, for example, update agent. 따라서, 장치 래퍼는 일반 업데이트 소프트웨어 및 특정한 전자 장치 펌웨어/소프트웨어의 상호작용/인터페이싱을 가능하게 해주도록 개발된다. Thus, a device is developed so as to give the wrapper to enable interaction / interfacing of the general update software and a particular electronic device firmware / software. 래퍼는 업데이트 에이전트의 맞춤화(customization) 없이 업데이트 에이전트 코드의 재사용을 용이하게 해준다. Wrapper facilitates the re-use of code updates agent without customization (customization) of the updated agent. 본 발명에 따른 실시예에서, 표시자 b 2 는 예를 들어 변환 1 단계(transform 1 phase)를 나타낼 수 있다. In the embodiment according to the present invention, the indicator b 2, for example, may represent a conversion step 1 (transform 1 phase). 펌웨어/소프트웨어를 업데이트하는 단계는 업데이트가 완료되기 전에 소프트웨어 전체에 걸쳐 다수의 패스(pass)(업데이트 패스)를 포함할 수 있다. Updating the firmware / software may include a plurality of passes (pass) (pass updates) over the software until the update is complete. 변환 단계 표시자(transform phase indicator)는 예를 들어 업데이트가 중단되었을 때 또는 전자 장치가 업데이트의 일부로서 재부팅되었을 때 업데이트가 어느 패스 또는 단계를 수행하고 있었는지를 부트 로더(111)에 경보/통지하는 표시자를 포함할 수 있다. Conversion step indicator (transform phase indicator), for example, when the update is interrupted, or an electronic device, an alarm to the boot loader (111) whether the update has been had to perform one pass or step when rebooting, as part of the update / notification display may include a person who. 변환 1 단계 표시자, 예를 들어 b 2 는 장치가 재부팅되었을 때 또는 업데이트가 중단되었을 때 업데이트가 완료되었거나 소프트웨어 전체에 걸쳐 제1 단계 패스에 관여되어 있었음을 나타낼 수 있다. Conversion step indicator, for example, b 2 may represent that there was or update has been completed the first step involved in the first pass over the software when the update is interrupted or when the instrument is rebooted. 변환 1 단계가 완 료되었을 때, 표시자 b 2 의 값은 복수의 장치 래퍼에서 0으로 설정될 수 있다. When the conversion step has been completed, indicator values of b 2 may be set to zero in a plurality of devices wrapper. 표시자 b 2 에 대한 디폴트/초기 값은 예를 들어 1일 수 있다. The default / initial value for the indicator b 2 may be one days, for example. 복수의 변환 표시자가 표시자 블록(215)에 존재할 수 있고 또 업데이트를 수행함에 있어서 업데이트가 해야 할 것으로 생각될 수 있는 패스 또는 단계의 수에 따라 표시자 블록(215)에서 평가될 수 있다. A plurality of transformation marker can be evaluated in the indicator block 215 passes or indicator block 215 depending on the number of steps that can may also be considered to be an update in performing an update on the present. 본 발명에 따른 예시적인 실시예에서, 3개의 변환 단계, 예를 들어 사전-프로세싱 단계(예를 들어, 변환 1), 업데이트 단계(예를 들어, 변환 2), 및 사후-프로세싱 단계(예를 들어, 변환 3)이 이용될 수 있다. In an exemplary embodiment according to the present invention, three transformation steps, such as pre-processing steps (e.g., conversion 1), the update phase (e.g., conversion 2), and post-processing steps (e. g., conversion 3) may be used. 본 발명에 따른 실시예에서, 표시자 b 3 는 예를 들어 업데이트 완료 표시자를 포함할 수 있다. In the embodiment according to the present invention, the indicator b 3 may include, for example, those updates completed display. 업데이트가 완료되었을 때, 표시자 b 3 의 값은 0으로 설정될 수 있다. When the update is complete, the value of the indicator b 3 may be set to zero. 표시자 b 3 에 대한 디폴트/초기 값은 예를 들어 1일 수 있다. The default / initial value for the indicator b 3 may be one days, for example. 본 발명에 따른 실시예에서, 표시자 b 0 가 0으로 설정되고 표시자 b 3 가 1로 설정되어 있을 때, 예를 들어 업데이트가 개시될 수 있다. When an embodiment according to the present invention, the indicator b is 0 is set to 0 and b 3 indicator is set to 1, for example, be updated is disclosed. 본 발명에 따른 실시예에서, 업데이트 절차가 완료될 때, 도 2에 도시한 반환 코드(213)는 부트 로더(111), 업데이트 패키지(123), 업데이트 에이전트(113), 및/또는 업데이트 에이전트(UA) 소프트웨어 개발 킷(SDK)에 의해 제공되는 반환 값으로 설정될 수 있다. In an embodiment according to the present invention, when the update process is completed, a return code 213 shown in Fig. 2 is a boot loader 111, the update package 123, the update agent 113, and / or update agent ( UA) may be set as the return value offered by a software development kit (SDK). UASDK는 장치 래퍼, 즉 업데이트 에이전트(113), 업데이트 패키지(123), 및 부트 로더(111)와 연관된 복수의 함수를 포함하는 라이브러리를 포함할 수 있다. UASDK may comprise a library comprising a plurality of functions associated with a device, the wrapper, that is, update agent 113, the update package 123, and the boot loader (111). 본 발명에 따른 다른 실시예에서, 복수의 함수는 임의의 특정 소 프트웨어와 직접 관련이 없는 잡다한 함수일 수 있지만 예를 들어 잡다한 함수를 수행하는 데 사용되는 정보 및/또는 데이터를 포함할 수 있다. In another embodiment according to the present invention, a plurality of functions may include information and / or data that sundry be a function not directly related to any particular software for, but for example, used to perform miscellaneous functions. 본 발명에 따른 실시예에서, 도 2에 도시된 업데이트 패키지 주소(209)는 예를 들어 4 바이트(4B)를 포함할 수 있다. In the embodiment according to the present invention, the update package address 209 shown in Figure 2 may include, for example, a 4-byte (4B). 4 바이트의 업데이트 주소 블록(209)은 업데이트 패키지, 예를 들어 업데이트 패키지(123)의 도 1에 도시된 NVM(109)에서의 주소를 저장하는 데 사용될 수 있다. Update address block 209 of four bytes can be used to store the address in the NVM (109) shown in Figure 1 of the update package, such as the update package 123. 본 발명의 측면들은 전자 장치를 부팅 및 업데이트하는 3-단계 방법에서 찾아볼 수 있다. Aspect of the present invention may be found in a 3-step method of booting and updating the electronic device. 제1 단계 부팅/재부팅(디폴트 부팅/재부팅이라고도 함)에서, 전자 장치는 예를 들어 전자 장치에서의 펌웨어/소프트웨어를 부팅/재부팅하고 통상적인 동작을 개시할 수 있다. In a first step the boot / reboot (also known as the default boot / reboot), the electronic device may, for example boot / reboot the firmware / software in the electronic device, and discloses a conventional operation. 제2 단계 업데이트 부팅/재부팅에서, 전자 장치는 전자 장치에서의 임의의 및/또는 모든 펌웨어/소프트웨어를 부팅/재부팅 및 업데이트할 수 있다. In step 2 Update Boot / reboot, the electronic device may boot / reboot and updating any and / or all of the firmware / software in the electronic device. 그렇지만, 업데이트 에이전트(113)가 업데이트 중에 있는 경우, 업데이트 에이전트(113)의 백업 복사본은 업데이트 에이전트를 업데이트하기 전에 예를 들어 NVM(109)에 저장될 수 있다. However, if the update agent 113 is in the update, the backup copy of the update agent 113 may be stored for example prior to updating the update agent into the NVM (109). 제2 업데이트 부팅/재부팅 방법은 장애 허용 방식인데, 그 이유는 업데이트 에이전트(113)의 업데이트 동안에 장애가 발생하는 경우 원래의 업데이트 에이전트(113)의 백업 복사본이 호출될 수 있으므로 파국적인 고장이 회피될 수 있기 때문이다. The second inde updated boot / reboot method is how fault-tolerant, because the update if a failure occurs during the update of Agent 113, so you have a backup copy of the original update agent 113 may be called to be a catastrophic failure avoidance because. 제3 단계 업데이트 부팅/재부팅에서, 전자 장치는 전자 장치에서의 임의의 및/또는 모든 펌웨어/소프트웨어를 부팅/재부팅 및 업데이트할 수 있다. In step 3, the boot update / reboot, the electronic device may boot / reboot and updating any and / or all of the firmware / software in the electronic device. 그렇지 만, 이 방법에서, 부트 로더(111)는 업데이트 에이전트(113)가 부적절하게 업데이트되었는지를 판정할 수 있다. Not only, in this way, the boot loader 111 may determine whether the update agent 113 is inappropriately updated. 따라서, 부팅/재부팅 동안에, 업데이트 에이전트(113)의 백업 복사본이 호출되고 NVM(109)으로부터 RAM(125)으로 압축 해제되며, 파국적인 고장이 회피된다. Thus, during the boot / reboot, is called a backup copy of the update agent 113 is decompressed into RAM (125) from the NVM (109), a catastrophic failure is avoided. 제3 업데이트 부팅/재부팅 방법은 장애 허용 방식인데 그 이유는 업데이트 에이전트(113)의 업데이트 동안에 고장이 검출되는 경우, 원래의 업데이트 에이전트(113)의 백업 복사본이 재사용가능 상태로 있으므로 파국적인 고장이 회피되기 때문이다. Third Update boot / reboot method if inde fault-tolerant The reason is that the failure was detected during the update of the update agent 113, the catastrophic failures avoid a backup copy of the original update agent 113, so a reusable state because it is. 본 발명의 측면들은 또한 업데이트 소프트웨어를 포함하는 업데이트 에이전트, 예를 들어 도 1에 도시된 업데이트 에이전트(113)를, 예를 들면 역시 도 1에 도시된 모바일 핸드셋(107) 등의 전자 장치 내에 통합(integrate)시키는 것에서도 찾아볼 수 있다. The update agent 113 shown in the update agent, e.g., FIG. 1, including the aspects of the invention may also update the software, for example, also integrated into the electronic device such as the mobile handset 107 is shown in Figure 1 ( from which integrate) can also be found. 본 발명의 측면들은 또한 도 1에 도시된 업데이트 패키지 생성자(131) 등의 업데이트 패키지 생성자에서도 찾아볼 수 있다. Aspects of the present invention can also be found in the update package generator, such as the update package generator 131 shown in Fig. 업데이트 패키지 생성자(131)는, 전자 장치 이미지들을 위한 커맨드 라인(command line)을 이용함으로써, 예를 들어 모바일 핸드셋(107) 등의 전자 장치에서의 펌웨어(117), OS(119), 전자 장치 애플리케이션(121), 및 업데이트 에이전트(113)(이 모두는 도 1에 도시되어 있음) 중 적어도 하나를 업데이트시키는 업데이트 패키지를 생성할 수 있다. Update package generator 131, the electronic device by using a command line (command line) for the image, such as the mobile handset 107, the firmware in the electronic apparatus such as a (117), OS (119), electronics applications 121, and the update agent 113 may generate an update package for updating at least one of (all of which that shown in Figure 1). 커맨드 라인은, 명령을 입력하기 위한 그래픽 인터페이스와는 달리, 프로세싱 장치에 명령을 입력하기 위한 텍스트 인터페이스를 포함할 수 있다. Command line, unlike the graphical interface for inputting a command, and may include a text interface for inputting a command to the processing device. 본 발명은 커맨드 라인 인터페이스에 한정되지 않으며 본 발명에 따른 다른 실시예에서는 그래픽 인터페이스도 포함할 수 있다. The invention may include other embodiments, a graphical interface in accordance with the present invention is not limited to the command line interface. 본 발명에 따른 실시예에서, 업데이트 에이전트 소프트웨어 개발 킷(UASDK)은 UASDK 엔진을 포함할 수 있다. In the embodiment according to the present invention, the update agent software development kit (UASDK) may include UASDK engine. UASDK 엔진은 업데이트를 수행하기 위한 최소한의 기능을 포함할 수 있다. UASDK engine may include a minimum level of functionality for performing the update. 본 발명에 따른 실시예에서, 예를 들어 모바일 핸드셋(107) 등의 예시적인 전자 장치는 이하의 구성 및/또는 사양을 포함할 수 있다. In the embodiment according to the present invention, for example, the exemplary electronic device such as mobile handset 107 may include the following configuration and / or specification. 전자 장치는 예를 들어 NVM(109) 등의 플래쉬 유형 비휘발성 메모리를 포함할 수 있다. Electronic devices may include, for example, a flash type non-volatile memory such as an NVM (109). 플래쉬 유형 비휘발성 메모리(109)는 예를 들어 Advanced Micro Devices, Inc.에 의해 설계된 AMD DS42585일 수 있다. A flash type non-volatile memory 109 may be, for example, AMD DS42585 designed by Advanced Micro Devices, Inc.. AMD DS42585는 32 메가비트(4M x 8-비트/2M x 16-비트) 상위 부트 플래쉬(top boot flash) 및 64 KB의 뱅크 크기, 8 KB * 8의 부트 블록 크기, 7 MB(0x0 - 0x700000)의 코드 크기, 및 1 MB(0x1200000 - 0x1300000)의 RAM을 갖는 8 메가비트(1M x 8-비트/512K x 16-비트) 정적 RAM 장치이다. AMD DS42585 is 32 megabits (4M x 8- Bit / 2M x 16- bit) flash the boot upper (top boot flash) and the boot block of 64 KB bank size, 8 KB * 8 size, 7 MB (0x0 - 0x700000) in code size, and 1 MB - 8 Mb of RAM having (0x1200000 0x1300000) (1M x 8- bit / 512K x 16- bit) is a static RAM device. 도 3은 본 발명의 실시예에 따른, 예를 들어 도 1에 도시된 모바일 핸드셋(107) 등의 예시적인 전자 장치에 대한 플래쉬 메모리의 예시적인 메모리 구성(305)을 나타낸 블록도이다. Figure 3 is a block diagram showing the mobile handset 107 is an exemplary memory configuration 305 in the flash memory of the exemplary electronic device, such as shown in Figure 1, for, for example, in an embodiment of the present invention. 도 3에 도시된 예시적인 플래쉬 메모리(305)는 전자 장치 부트 코드를 저장하는 메모리 블록(338) 및 미지정 메모리 블록(337)을 포함할 수 있다. The exemplary flash memory 305 shown in Figure 3 may comprise a block of memory 338 and the unassigned memory block 337 for storing the electronic device boot code. 예시적인 플래쉬 메모리(305)는 또한 업데이트 에이전트 실행파일을 저장하기 위한 메모리 블록(336)을 포함할 수 있다. An exemplary flash memory 305 may also include a memory block 336 for storing the updated agent executable. 업데이트 에이전트 실행파일을 저장하기 위한 메모리 블록(336)은 예비 블록(350)과 체크섬 블록(340)으로 더 세분될 수 있다. A memory block 336 for storing the updated agent executable file can be further divided into the spare block 350, the checksum block 340. 예비 블록(350)은 예를 들어 32 바이트 길이일 수 있다. Spare block 350 can be, for example, 32 bytes long. 체크섬 블록(340)은 예를 들어 4 바이트 길이일 수 있다. Checksum block 340 can be, for example, 4 bytes long. 예시적인 플래쉬 메모리(305)는 또한 전자 장치 애플리케이션을 저장하기 위한 메모리 블록(335) 및 예비 메모리 뱅크(334)를 포함할 수 있다. An exemplary flash memory 305 may also include a memory block 335 and a spare memory bank 334 for storing the electronic device applications. 예비 메모리 뱅크(334)는 또한 또하나의 예비 메모리 블록(360)으로 세분될 수 있다. Spare memory bank 334 may also be sub-divided again into a spare memory block 360. 예비 메모리 블록(360)은 예를 들어 도 2에 도시한 업데이트 상태 표시자(205) 등의 업데이트 상태 표시자를 저장하는 데 사용될 수 있다. Spare memory block 360, for example, may also be used to store characters update status, such as an update status indicator 205 shown in Fig. 예비 메모리 블록(360)은 예를 들어 32 바이트 길이일 수 있다. Spare memory block 360 can be, for example, 32 bytes long. 예시적인 플래쉬 메모리(305)는 또한 미지정 메모리 블록(333)을 포함할 수 있다. An exemplary flash memory 305 may also include an unassigned memory blocks (333). 미지정 메모리 블록(333)은 또한 업데이트 상태 블록(370)으로 세분될 수 있다. Food memory block 333 may also be divided into the updated status block 370. 업데이트 상태 블록(370)은 예를 들어 도 2에 도시한 업데이트 상태 표시자(205) 등의 업데이트 상태 표시자를 저장하는 데 사용될 수 있다. Updated status block 370 may, for example, also be used to store a single character update status indicator 205 such as update of the status shown in Fig. 업데이트 상태 표시자(370)는 예를 들어 32 바이트 길이일 수 있다. Update status indicator (370) may be, for example, 32 bytes long. 도 3에 도시한 예시적인 플래쉬 메모리(305)는 또한 예를 들어 업데이트 패키지를 수신 및 저장하기 위해 예비된 메모리 블록(332)을 포함할 수 있다. An exemplary flash memory 305 shown in Figure 3 and for example may include a block of memory 332 reserved for receiving and storing the update package. 예시적인 플래쉬 메모리(305)는 또한 또하나의 미지정 메모리 블록(331)을 포함할 수 있다. An exemplary flash memory 305 also may also include one of the memory blocks not assigned (331). 본 발명에 따른 실시예에서, 3-단계 부팅 테스트를 명백하게 설명하기 위해, 2개의 업데이트 패키지가 예를 들어 도 3에 도시된 메모리 블록(332)에 플래쉬/저장될 수 있다. In the embodiment according to the present invention, in order to clarify the three-step test boot, the two update package may be a flash / stored in a memory block 332 shown in Figure 3, for example. 업데이트 패키지는 예를 들어 기본 버전(base version) 및 새 버전으로 변환된 기본 버전을 포함할 수 있다. Update package may include, for example, a basic version of the conversion to the basic version (base version) and the new version. 본 발명에 따른 실시예에서, 업데이트 상태 블록(360, 370)은 각각 예비 메모리 뱅크(334) 및 미지정 메모리 블록(333)의 마지막 및 처음의 32 바이트를 포함할 수 있다. In the embodiment according to the present invention, updated status block (360, 370) may each include a first and last 32 bytes of a spare memory bank 334 and unspecified memory block 333. 그렇지만, 초기화/부팅/재부팅 동안에 데이터/정보에 액세스할 시에 문제가 발생하는 경우, 업데이트 상태 블록(360, 370)은 또하나의 다른 이용가능한 장소로 변경/이동될 수 있다. However, it can be reset / boot / if a problem at the time of access to the data / information occurs during a reboot, it changes the update status block (360, 370) to another other available place of the / movement. 본 발명에 따른 실시예에서, 예비 메모리 블록(360) 및 업데이트 상태 블록(370)은 둘다 예를 들어 32 바이트 길이일 수 있다. In the embodiment according to the present invention, the spare memory block 360 and updates the status block 370 may be both, for example 32 bytes long. 이들 블록은 업데이트 에이전트(113)의 상태를 검출하고 그의 초기화를 용이하게 해주는 데 사용되며 또 예를 들어 업데이트 에이전트(113)의 상태를 UASDK, 부트 로더(111) 및/또는 핸드오프 에이전트(166)에 경보/통지하는 데 사용될 수 있다. These blocks are used, which detect the state of the update agent 113 and facilitate its initialized again, for example the status of the update agent 113 UASDK, the boot loader 111 and / or the hand-off agent 166 in can be used to alert / notification. 본 발명에 따른 실시예에서, 핸드오프 에이전트(166), 펌웨어 관리자(158), 다운로드 에이전트(196), 기타 등등은 처음부터 전자 장치 이미지로 통합되지 않을 수 있으며 그에 따라 예를 들어 JTAG 플래쉬 프로그래밍을 사용하여 업데이트 패키지(123)의 수동 다운로드 동안에 업데이트 패키지(113)가 테스트될 수 있게 해준다. In the embodiment according to the present invention, the handoff agent 166, the firmware manager 158, the download agent 196, and the like can not be integrated into the electronic device images in the first place the JTAG flash programming, for example, thus It can be used to allow the update package (113) during the test manually download the update packages (123). JTAG은 집적 회로를 테스트하는 인터페이스의 표준 사양을 포함한다. JTAG includes a standard specification of the interface for testing an integrated circuit. JTAG은 집적 회로 기능의 상태의 검출 및 그의 제어를 가능하게 해준다. JTAG allows for the detection and his control of the state of the integrated circuit function. 본 발명에 따른 실시예에서, 전자 장치 메뉴는 업데이트 상태 표시자 블록(205) 내의 예시적인 업데이트 표시자 비트(예를 들어, b 0 , b 1 , b 2 및 b 3 )를 설정할 수 있게 되어 있을 수 있다. In an embodiment according to the invention, be an electronic device menu is able to set an exemplary update indicator bit (e.g., b 0, b 1, b 2 and b 3) in the update status indicator block 205 can. 본 발명에 따른 다른 실시예에서, 핸드오프 에이전트 (166)는 업데이트 상태 표시자 블록(205) 내의 예시적인 업데이트 표시자 비트(예를 들어, b 0 , b 1 , b 2 및 b 3 )를 설정할 수 있게 되어 있을 수 있다. In another embodiment according to the present invention, the handoff agent 166 is set to the exemplary update indicator bit (e.g., b 0, b 1, b 2 and b 3) in the update status indicator block 205 can be is so. 본 발명에 따른 실시예에서, 예를 들어 보안 및 인증 구현 등을 위한 베이스라인 구현(baseline implementation)이 업데이트 에이전트(113)를 이용하여 업데이트가능한 유효한 전자 장치 이미지를 생성하는 데 사용될 수 있다. In the embodiment according to the present invention, for example, using a secure and baseline implementation for implementing authentication, etc. (baseline implementation) The update agent 113 may be used to generate an updated image of a valid electronic apparatus possible. 예를 들면, 베이스라인 구현은 예를 들어 순환 중복 검사(CRC32) 등의 체크섬 구현, 예를 들어 bfzlib 압축 등의 압축 구현, 예를 들어 RSA를 갖는 MD5 등의 보안 구현, 예를 들어 Bitfone Corp.에 의해 개발된 (ARM의) 썸 프로세서(thumb processor)에 대한 예측자(predictor) 등의 예측자 구현, 검사자(surveyor) 구현(업데이트 에이전트 검증 및 업데이트 중단/고장 식별), 힙 모듈(heap module) 구현, 및 유틸리티 인터페이스 구현을 포함할 수 있다. For example, a baseline implementation for implementing a checksum, such as example a cyclic redundancy check (CRC32), such as the implementation of such compression bfzlib compression, for example, implementation of the security such as MD5 with RSA, for example Bitfone Corp. the (ARM's) thumb processor (thumb processor) predictor (predictor) predictor implemented, inspectors (surveyor) implementations, such as for (update agent verified and updated stop / fault) developed by the heap module (heap module) It may include implementation, and utility interface implementation. 본 발명에 따른 실시예에서, 업데이트 에이전트(113)의 기능을 테스트하기 위해, 전자 장치는 또한 모든 가능한 전자 장치 특징이 전자 장치에 통합되고 존재하도록 프로그램될 수 있다. To test the function of the embodiment according to the present invention, the update agent 113, the electronic device may also be any electronic device, the program characterized in that the integrated electronic device to be present. 전자 장치 테스트 특징은 펌웨어/소프트웨어의 장애 허용 업데이트의 테스트, 업데이트 에이전트(113)의 장애 허용 업데이트의 테스트, 3-단계 부팅 방법의 테스트 및 썸 예측(thumb prediction) 방법의 테스트를 포함할 수 있다. Electronics test features may include a test of the test, and the thumb of the prediction step firmware / test of the fault tolerant update of the software, testing of the fault tolerant update of the update agent 113, a 3-boot method (thumb prediction) method. 본 발명에 따른 실시예에서, 핸드오프 에이전트(166)는 테스트에 이용가능하지 않을 수 있지만, 핸드오프 에이전트 인터페이스 및 장치 래퍼는 이용될 수 있 다. In the embodiment according to the present invention, but the hand-off agent 166 may not be available for testing, the handoff agent interface and the device is a wrapper can be used. 본 발명에 따른 실시예에서, UASDK 라이브러리는 업데이트 에이전트(113)의 기능의 구현을 위해 제공되는 단일의 라이브러리를 포함할 수 있다. In the embodiment according to the present invention, UASDK library may include a single library in which is provided for the implementation of the functionality of the update agent 113. 본 발명에 따른 다른 실시예에서, UASDK 라이브러리는 업데이트 에이전트(113)의 기능을 구현하기 위해 제공되는 복수의 애플리케이션-특정 라이브러리를 포함할 수 있다. In another embodiment according to the present invention, UASDK library is a plurality of applications that are provided to implement the functionality of the update agent 113 may include a particular library. 베이스라인 업데이트 에이전트 기능 모두는 라이브러리/라이브러리들에는 물론 현재 이용가능한 모든 업데이트 에이전트 플러그-인에도 포함될 수 있다. All baseline update agent functions are all available, as well as update agents plugs are available in the library / libraries can be included in the. 기능은 특정한 목표 전자 장치 환경을 위해 컴파일될 수 있다. Functions can be compiled for a specific target electronic device environment. 본 발명에 따른 실시예에서, UASDK 라이브러리/라이브러리들은 소스 디렉토리 세트(세트들)를 포함할 수 있다. In the embodiment according to the present invention, UASDK library / libraries may include a source directory set (sets). 통합 시에, 업데이트 에이전트(113)를 링크 및 컴파일하도록 구성된 파일들은 전자 장치 인터페이스 및 장치 래퍼를 조정함으로써 선택될 수 있다. At the time of integration, the file is configured to link, and compile the update agent 113 can be selected by adjusting the electronics interface, and the wrapper apparatus. 도 4는 본 발명의 실시예에 따른 예시적인 전자 장치에서의 펌웨어(117), 소프트웨어 애플리케이션(121), 오퍼레이팅 시스템(OS)(119) 및 업데이트 에이전트(113) 중 임의의 것의 예시적인 장애 허용 업데이트 방법을 나타낸 흐름도(405)이다. Figure 4 is a firmware 117, the software application 121, an operating system (OS) (119) and updating an exemplary fault-tolerant update of any of the agent 113 in an exemplary electronic device according to an embodiment of the present invention a flow chart 405 illustrating a method. 도 4에 도시된 예시적인 방법은 베이스라인 라이브러리/라이브러리들에 존재하는 UASDK 엔진, 전자 장치 인터페이스 및 장치 래퍼를 사용하여 펌웨어/소프트웨어를 업데이트하는 데 사용될 수 있다. The exemplary method shown in FIG. 4 may be used to use the UASDK engines, electronics interface and wrapper apparatus existing in the baseline library / libraries update the firmware / software. 이하의 구현/방법은 업데이트 동안에 엔진 프로토타입(engine prototype), 인터페이스 함수, 및 래퍼/드라이브 함수를 어떻게 사용하는지를 나타낸 것이다. The following implementation / method is shown how to use the engine prototype during the update (prototype engine), the function interface, and the wrapper / drive function. 본 발명에 따른 실시예에서, ua_Main_Start() 함수는 목표 펌웨어의 업데이트를 개시하는 예시적인 모듈이다. In the embodiment according to the present invention, ua_Main_Start () function is an exemplary module for initiating an update of the target firmware. 본 방법은 시작(블록 401)에서 시작할 수 있다. The method may begin at the start (Block 401). 본 방법은 펌웨어(117), 하드웨어 컴포넌트, 오퍼레이팅 시스템(OS)(119), 소프트웨어 애플리케이션(121), 및/또는 업데이트 에이전트(113) 중 하나에의 액세스를 초기화하는 단계(블록 440)를 포함할 수 있다. The method firmware 117, the hardware components, an operating system (OS) (119), software application 121, and / or may comprise a step (block 440) to initialize the hanae of access of the update agent 113 have. 소프트웨어/펌웨어에의 액세스를 초기화하는 단계는 또한 데이터를 비휘발성 플래쉬 메모리(109)로부터 예를 들어 RAM(125)으로 노출/압축 해제시키는 장치 래퍼 함수에의 액세스를 초기화하는 단계를 포함할 수 있다. Initiating access to the software / firmware may also include a step of initializing the access to the device wrapper function to release exposure / compressed data in a RAM (125), for example, from non-volatile flash memory 109 . 본 방법은 또한 암호화에 액세스하는 단계(블록 441)를 포함할 수 있다. The method also may include the step (block 441) to access the encryption. 암호화(암호화 엔진/소프트웨어)에 액세스하는 단계(블록 441)는 예를 들어 261-바이트 공개키, 1024-바이트 공개키, 기타 등등의 공개키에 액세스하는 단계를 포함할 수 있다. Encryption accessing a (cryptographic engine / software) (block 441) may include, for example, a step of access to a public key of 261- byte public key, and 1024-byte public key, and the like. 본 방법은 또한 전자 장치의 업데이트를 용이하게 해주는 변수에 액세스하는 단계(블록 442)를 포함할 수 있다. The method may also comprise the step of accessing a variable, to facilitate the update of the electronic device (block 442). 전자 장치의 업데이트를 용이하게 해주는 데 사용되는 변수에 액세스하는 단계는 예를 들어 UASDK에 의해 사용되는 복수의 전역 변수를 동적으로 할당하는 단계를 포함할 수 있다. Accessing a variable that is used to facilitate the update of the electronic device may include, for example, the step of dynamically allocated to a plurality of global variables that are used by the UASDK. void 포인터도 또한 초기화를 위해 UASDK 엔진에 전송될 수 있다. void pointer also can also be sent to UASDK engine for initialization. void 포인터는 전체 업데이트에 걸쳐 존속될 수 있다. void pointers can be persisted throughout the update. 본 방법은 업데이트 동안에 사용하기 위해 할당된 메모리를 해제(free)시키는 단계(블록 446)를 포함할 수 있다. The method may include (block 446) to release (free) memory allocated for use during the update. 할당된 메모리를 해제시키는 단계는 또한 예를 들어 순환 중복 검사(CRC) 테이블 또는 체크섬 테이블로부터 메모리를 해제시키는 단계를 포함할 수 있다. The step of releasing the allocated memory may also, for example may comprise the step of releasing a memory from a cyclic redundancy check (CRC) checksum table or tables. 본 방법은 또한 업데이트 동안에 예비해둔(set-aside), 할당된 및/또는 사용된 모든 임시 기입 유닛/블록/뱅크를 플래쉬 소거(flash erase)하는 단계(블록 447)를 포함할 수 있다. The method may also include a pre-haedun (set-aside), assigned and / or all of the temporary write unit / block / bank of the flash erasing used (flash erase), the method comprising (block 447) during the update. 임시 기입 유닛을 플래쉬 소거하는 단계는 또한 플래쉬-소거 명령(flash-erase command)을 발행하는 단계를 포함할 수 있다. The method comprising flash erasing the temporarily write unit also flash can comprise the step of issuing the erase command (flash-erase command). 본 방법은 또한 복수의 전역 변수를 위해 할당된 메모리를 해제시키는 단계를 포함할 수 있다. The method may also comprise the step of releasing the memory allocated to the plurality of global variables. 본 방법은 또한 핸드오프 에이전트(166)에 대한 업데이트 상태 표시자(205)에서의 업데이트 상태 플래그/표시자를 설정하는 단계(블록 448)를 포함할 수 있다. The method may also comprise the step of setting update state flag characters / displayed in an update status indicator (205) for the handoff agent 166 (block 448). 본 방법은 또한 업데이트 패키지, 예를 들어 도 1에 도시한 업데이트 패키지(123)를 삭제(clean up)하는 단계(블록 449)를 포함할 수 있다. The method also may include the deletion, update packages 123 shown in Figure 1, for the update package, for example, (clean up) step (block 449) to. 업데이트 패키지 (123)를 삭제하는 단계는 업데이트 동안에 이용된 장치 래퍼 함수들을 프로세싱하는 단계를 포함할 수 있다. Step of deleting the update package 123 may include the step of processing the device wrapper functions used during the update. 본 방법은 또한 전자 장치를 리셋(reset)시키는 단계(블록 451)를 포함할 수 있다. The method may also include the step (block 451) to the electronic device reset (reset). 전자 장치를 리셋시키는 단계는 또한 전자 장치를 재부팅시키는 단계를 포함할 수 있다. The step of resetting the electronic device can also include a step of rebooting the electronic device. 도 4에 도시된 방법은 블록(402)에서 종료될 수 있다. The method illustrated in Figure 4 can be terminated at block 402. 도 5는 본 발명의 실시예에 따른 도 4(블록 445)에 도시된 예시적인 전자 장치(도 1에 도시된 모바일 핸드셋(107) 등)의 예시적인 고장 허용 업데이트 방법과 연관된 명령어들의 루프에 대한 부가적인 상세를 나타낸 흐름도(505)이다. 5 is on a loop of the exemplary fault-tolerant command associated with the update process of the exemplary electronic device (a mobile handset 107, such as shown in FIG. 1) shown in Figure 4 (block 445) in accordance with an embodiment of the present invention a flow chart 505 showing the additional detail. 본 방법은 사용자 인터페이스 메시지를 디스플레이하는 단계(블록 540)를 포함할 수 있다. The method may include the step of displaying a user interface message (block 540). 사용자 인터페이스 메시지를 디스플레이하는 단계는 업데이트를 시작하기 위해 고객-구성 구현(customer-configured implementation)을 사용하는 단계를 포함할 수 있다. Displaying a user interface message is a customer to start the updated-can configuration implemented including using a (customer-configured implementation). 본 방법은 또한 메모리 관리 시스템이 초기화되고 동작 상태에 있는지를 판정하는 단계(블록 541)를 포함할 수 있다. The method also may include the step (block 541) for determining that the memory management system is initialized and the operating states. 본 방법은 또한 힙 라이브러리(heap library)를 여는 단계(블록 542)를 포함할 수 있으며, 여기서 업데이트를 실행하기 위한 메모리 환경이 구축될 수 있다. The method may also include the steps to open the library heap (heap library) (block 542), where there is a memory environment can be established for carrying out the update. 본 방법은 또한 업데이트 패키지(123)를 압축 해제시켜 원래의 업데이트 패키지(raw update package)에 대한 포인터를 생성하는 단계(블록 543)를 포함할 수 있다. The method also may include the step (block 543) for decompressing the update package 123 by generating a pointer to the original update packages (raw update package). 압축 해제는 Bitfone Corp.의 zlib 압축 해제 구현을 이용하는 단계를 포함할 수 있다. Decompression may comprise the step of using the zlib decompression implementations of Bitfone Corp.. 압축 해제는 또한 RAM(125)에 위치할 수 있는, 업데이트를 위해 이용되는 압축 해제된 업데이트 패키지를 가리키기 위해 생성된 포인터를 이용하는 단계 를 포함할 수 있다. Decompression may also include the step of using the generated pointer to point to compress the updated package to be used for the release, updates that may be located in a RAM (125). 본 방법은 또한 업데이트 패키지(123) 데이터/코드에 대해 RSA 검사를 갖는 MD5 등의 보안 검사를 수행하는 단계(블록 544)를 포함할 수 있다. The method also may include the step (block 544) for performing security checks, such as MD5 with RSA check on the update package 123, a data / code. 본 방법은 또한 체크섬 라이브러리 및/또는 CRC 라이브러리를 초기화하는 단계(블록 545) 및 업데이트 에이전트 엔진을 초기화하는 단계(블록 546)를 포함할 수 있다. The method also may include the step (block 546) to initialize a checksum library and / or step (block 545) and updating the agent engine to initialize the CRC library. 전역 void 포인터 및 할당된 체크섬 포인터는 초기화 동안에 초기화 루틴으로 전달될 수 있다. Global void pointer and assigned checksum pointers may be passed to the initialization routine during initialisation. 전체적인 업데이트 구조(global update structure)도 또한 초기화될 수 있다. The overall structure update (global update structure) can be also reset. 본 발명에 따른 실시예에서, 체크섬 포인터는 전역 void 포인터에 의해 참조될 수 있으며 다른 함수로 전달되지 않을 수 있다. In an embodiment according to the present invention, the checksum pointers may be referred to by the global void pointer which will be passed to other functions. 본 방법은 또한 업데이트된 펌웨어/소프트웨어 이미지를 구축(build)하기 위해 업데이트 에이전트 엔진이 이용할 수 있는 업데이트 패키지(123)를 로드하는 단계(블록 547)를 포함할 수 있다. The method also has the update agent engine may comprise a step (block 547) to load the update package 123 that can be used to construct (build) the updated firmware / software image. 업데이트 패키지(123)를 로드하는 단계는 또한 업데이트 패키지 크기를 평가하는 것 및 계산된 체크섬을 평가하는 것 둘다에 의해 업데이트 패키지(123)의 유효성을 검사하는 단계를 포함할 수 있다. And loading the update package 123 may also include the step of checking the validity of the update package 123 by the both to evaluate the updated package to evaluate the size and the calculated checksum. 검사자(surveyor)는 예를 들어 최초의 펌웨어 검증 및 업데이트 절차 중단의 식별 둘다를 지원할 수 있다. Tester (surveyor), for example, may support the identification both of the first firmware verification and updating procedures stops. 검사자는 예를 들어 업데이트 에이전트(113) 또는 부트 로더(111)의 컴포넌트일 수 있다. The check, for example, be a component of the update agent 113 or a boot loader (111). 비 장애 허용 방식으로 수행되는 통합(integration)의 경우, 최초의 펌웨어 검증은 실행될 수 있지만 업데이트 절차 중단의 식별은 건너뛸 수 있다. In the case of integration (integration) it is performed to allow non-disability scheme, the first firmware verification can be executed, but may skip the identification of the update process interruption. 업데이트 절차 중단의 식별을 건너뛰는 것은 검사자와 관련이 있는 장치 래퍼/드라이버 함수를 설정함으로써 달성될 수 있다. It skips the identification of the update procedure is interrupted can be achieved by setting the device rapper / driver functions that are related to the tester. 검사자 함수는 나중에 사용될 복원의 인덱스를 반환할 수 있다. Tester function can be used to return the index of the restoration later. 본 방법은 또한 최초의 펌웨어(117)를 검증하고 업데이트를 모니터링하는 단계(블록 548)를 포함할 수 있다. The method may also include the step (block 548) to verify the first firmware (117) and monitors the update. 본 방법은 또한 업데이트 변환(변환 단계 표시자)을 호출하고 포인터 및 복원 인덱스를 전송하는 단계(블록 549)를 포함할 수 있다. The method also may include the step (block 549) to call the update transformation (conversion step indicator) and sends the pointer and restores index. 앞서 기술한 명령어들의 루프는 업데이트가 완료될 때까지 필요에 따라 여러번 반복될 수 있다. Loop of instructions previously described may be repeated several times as needed, until the update is complete. 도 5에 도시한 방법은 블록(502)에서 종료되고, 여기서 본 방법은 도 4의 블록(446)에서 계속될 수 있다. Also a method shown in Figure 5 is ended at block 502, where the method may continue at block 446 of FIG. 본 발명에 따른 실시예에서, 인터페이스 함수는 예를 들어 UASDK에서의 모듈들 간의 지시(direction)를 조정하기 위해 C 파일로 제공될 수 있다. In the embodiment according to the present invention, the interface function, for example, it is provided in the C file, in order to adjust the directions (direction) between the modules in UASDK. 본 발명에 따른 실시예에서, 전자 장치 통합은 베이스라인 구현, 라이브러리/라이브러리들 및/또는 복수의 프로그램 호출을 이용할 수 있다. In the embodiment according to the present invention, the integrated electronic device may use a base line implementation, the library / libraries and / or a plurality of program call. 한 구현은 예를 들어 CRC32 등의 베이스라인 순환 중복 검사에 대한 프로그램 호출을 구현하는 것을 포함할 수 있다. One embodiment, for example, may include implementation of the program call to the duplicate baseline cycle test such as CRC32. 다른 구현은 예를 들어 썸 예측자(thumb predictor)를 링크시키는 것을 포함할 수 있다. Other implementations, for example, may include linking the thumb forecaster (thumb predictor). 다른 구현은 예를 들어 베이스라인 메모리 유틸리티를 구현하는 것을 포함할 수 있다. Other implementations, for example, may include an implementation of the baseline memory utility. 본 발명에 따른 실시예에서, 헤더 파일은 업데이트 동안 차후의 사용을 위해 또 예를 들어 업데이트 패키지 내에 포함시키기 위해 UASDK 라이브러리/라이브러리들로 구현되어야 하는 모든 프로토타입을 포함할 수 있다. In the embodiment according to the present invention, the header file may contain all of the prototype to be implemented in UASDK library / libraries for inclusion in the update package contains a further example for the use of future for updates. UASDK는 기입-플래쉬(write-flash) 함수 이전에 플래쉬 소거(flash erase) 함수를 호출할 수 있다. UASDK the write-you can call the flash (flash-write) functions before erasing the flash (flash erase) the function. 업데이트 에이전트(113)의 비 장애 허용 업데이트를 용이하게 해주기 위해, UASDK 라이브러리/라이브러리들은 컴파일되어 인터페이스 파일 및 장치 래퍼 파일에 링크될 수 있다. For now facilitates a non-fault-tolerant update of the Update Agent (113), UASDK library / libraries can be linked to the compiled interface files and system wrapper file. 출력은 16 진수 및/또는 평이한 이전 형태일 수 있다. Output can be a hex and / or plain old form. 사용될 진입점은 0x10000일 수 있다. The entry point can be used 0x10000. 예를 들어 이하에 나타낸 파일 등의 분산 로드 파일(scatter load file)이 사용될 수 있다. For example, the dispersion can be used (scatter load file) load files, such as files shown in the following. 업데이트 에이전트(113)의 장애 허용 업데이트의 경우, UASDK 라이브러리/라이브러리들은 컴파일되어 인터페이스 파일 및 장치 래퍼 파일에 링크될 수 있다. In the case of fault-tolerant update of the Update Agent (113), UASDK library / libraries have been compiled may be linked to the interfaces file and system wrapper file. 예를 들어 업데이트 에이전트(113) 등의 업데이트 에이전트의 장애 허용 업데이트를 지원하기 위해, 전술한 3-단계 부팅이 이하에서 도 6을 참조하여 기술하는 바와 같이 통합될 수 있다. For example, to support a fault tolerant update of the update agent, such as update agent 113, it may be integrated as will be described with reference to Figure 6. In the above-described 3-stage boot below. 본 발명에 따른 실시예에서, 업데이트 패키지(123)가 업데이트 상태 표시자, 예를 들어 도 2에 도시한 업데이트 상태 표시자(205)의 평가에 기초하여 검출되는 경우, 업데이트 에이전트, 예를 들어 도 1에 도시한 업데이트 에이전트(113)는 검증될 수 있다(블록 626). If in the embodiment according to the present invention, the update package 123 is detected based on the evaluation of the updated status indicator 205 shown in Figure 2, for updating status indicators, for example, also contains the update agent, e.g. the update agent 113 shown in Figure 1 may be verified (block 626). 업데이트 에이전트(113)가 유효한 것으로, 즉 동작 가능하고 및/또는 손상이 없는 것으로 판정되는 경우, 업데이트는 업데이트 에이전트(113)로의 분기로 진행할 수 있으며(블록 636), 여기서 업데이트가 수행될 수 있다(블록 686). If as an update agent 113 is valid, that is, it is determined that no operation is possible, and / or damage, the update may be carried out to proceed to the branch, and (block 636), wherein the update to the update agent 113 ( block 686). 업데이트의 완료 시에, 전자 장치는 다시 시동 또는 재부팅될 수 있다(블록 606). Upon completion of the update, the electronic device may be re-power-on or rebooted (block 606). 전자 장치는 또다시 업데이트 상태 표시자(205)를 평가하고 또다른 업데이트 패키지(123)가 존재하는지 여부를 판정하거나(블록 616) 업데이트가 완료되었는지 여부를 판정할 수 있다. The electronic device may determine whether the evaluated again for an updated status indicator 205 and also determines whether any other update package 123 is present or (block 616) the update is complete. 업데이트 패키지(123)가 존재하지 않는 경우, 업데이트가 완료되어 있는 경우, 및/또는 업데이트가 현재 수행되지 않은 경우, 전자 장치는 통상적인 동작을 개시할 수 있고(블록 676), 절차는 종료 블록(602)에서 종료할 수 있다. When the update package 123 is not present, in the case where the update is complete, and / or if the update is not performed now, the electronic device may initiate the normal operation, and (block 676), process termination block ( It may terminate at 602). 그렇지만, 업데이트 에이전트(113)의 백업 복사본 또는 예비 복사본이 유효한 것으로, 동작 가능한 것으로 및/또는 손상되지 않은 것으로 판정되는 경우, 업데이트는 예비 메모리 유닛/뱅크 내의 업데이트 에이전트(113)의 예비 복사본으로의 분기(블록 656)로 진행할 수 있으며, 여기서 업데이트가 수행될 수 있다(블록 686). However, updates to the backup copy or backup copy valid for the agent 113, the action, if available to and / or is determined to be not damaged, update the branch of the pre-copy of the update agent 113 in the pre-memory units / bank It may be, and may advance to (block 656), wherein the update is performed (block 686). 업데이트의 완료 시에, 전자 장치는 또다시 시동 또는 재부팅될 수 있다(블록 666). When the update is completed, the electronic apparatus can also be re-start-up or rebooted (block 666). 전자 장치는 업데이트 상태 표시자(205)를 평가하고 또다른 업데이트 패키지(123)가 존재하는지 여부를 판정할 수 있다(블록 616). Electronic device may determine whether or not the evaluation update status indicator 205, and another update package (123) is present (block 616). 업데이트 패키지(123)가 존재하지 않는 경우, 및/또는 업데이트가 현재 수행되지 않은 경우, 전자 장치는 통상적인 동작을 개시할 수 있고(블록 676), 절차는 종료 블록(602)에서 종료할 수 있다. When the update package 123 is not present, and / or if the update is not performed now, the electronic device may initiate the normal operation, and (block 676), the procedure may be terminated in an end block (602) . 도 7은 본 발명의 실시예에 따른 예시적인 전자 장치, 예를 들어 도 1에 도 시된 모바일 핸드셋(107)에 대한 플래쉬 메모리의 예시적인 메모리 구성(705)을 나타낸 블록도이다. 7 is a block diagram illustrating an exemplary electronic apparatus, for example, also indicated in Figure 1 an exemplary memory structure of a flash memory of the mobile handset 107, 705, according to an embodiment of the present invention. 플래쉬 메모리 구성(705)은 전자 장치 부트 코드를 저장하는 메모리 블록(781) 및 미지정 메모리 블록(779)을 포함할 수 있다. Flash memory configuration 705 may include a memory block 781 and unspecified memory block for storing boot code, an electronic device (779). 플래쉬 메모리 구성(705)은 또한 업데이트 에이전트(UA) 부트 1을 저장하는 메모리 블록(778) 및 업데이트 에이전트(UA) 부트 2를 저장하는 또하나의 메모리 블록(777)을 포함할 수 있다. Flash memory configuration 705 may also include one more memory block (777) to store the memory block 778 and the update agent (UA) to store the boot 2 Update Agent (UA) boot 1. 플래쉬 메모리 구성(705)은 또한 UA1 재배치가능 코드를 저장하는 메모리 블록(776)을 포함할 수 있다. Flash memory configuration 705 may also include a memory block 776 for storing the UA1 relocatable code. UA1 재배치가능 코드를 저장하는 메모리 블록(776)은 또한 서브블록 체크섬(740)을 포함할 수 있다. A memory block 776 for storing the UA1 relocatable code may also include a sub-block checksum 740. 체크섬(740)은 예를 들어 4 바이트 길이일 수 있다. Checksum 740 can be, for example, 4 bytes long. 본 발명에 따른 실시예에서, 플래쉬 메모리 구성(705)은 또한 예를 들어 전자 장치 애플리케이션(들)을 저장하는 메모리 블록(775)을 포함할 수 있다. In an embodiment according to the present invention, the flash memory configuration 705 may also, for example may include a memory block 775 for storing the electronic device application (s). 플래쉬 메모리 구성(705)은 또한 또하나의 UA 부트 1을 저장하는 메모리 블록(774) 및 또하나의 UA 부트 2를 저장하는 메모리 블록(773)을 포함할 수 있다. Flash memory configuration 705 may also include a memory block 773 for storing one more memory block 774 and another UA UA to store the boot 2 boot 1. 플래쉬 메모리 구성(705)은 또한 또하나의 UA1 재배치가능 코드를 저장하는 메모리 블록(772)을 포함할 수 있다. Flash memory configuration 705 may also include a memory block 772 for storing one more UA1 relocatable code. 본 발명에 따른 실시예에서, 메모리 블록(778)에 저장된 UA 부트 1은 예를 들어 메모리 블록(774)에 저장된 UA 부트 1과 동일할 수 있다. 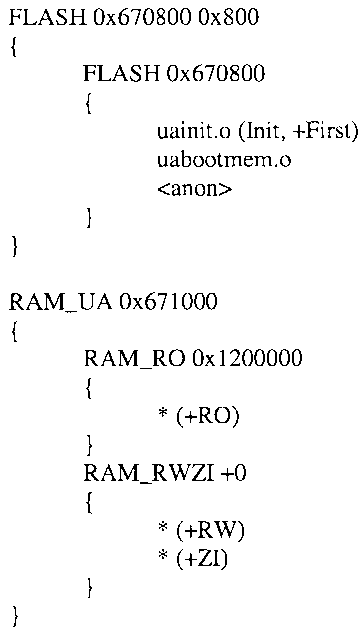 In the embodiment according to the present invention, UA boot 1 stored in the memory block 778 may, for example, be identical to the boot 1 UA stored in the memory block 774. 메모리 블록(777)에 저장된 UA 부트 2는 메모리 블록(773)에 저장된 UA 부트 2와 동일할 수 있다. UA boot 2 stored in the memory block 777 may be equal to the UA 2, the boot is stored in the memory block 773. 메모리 블록(776)에 저장된 UA1 재배치가능 코드는 예를 들어 메모리 블록(772)에 저장된 UA1 재배치가능 코드와 동일할 수 있다. UA1 relocatable code stored in the memory block 776, for example, may be equal to the UA1 relocatable code stored in the memory block 772. UA1 재배치가능 코드를 저장하는 메모리 블록(772)은 또한 체크섬(740)을 저장하는 서브블록을 포함할 수 있다. A memory block 772 for storing the UA1 relocatable code may also include sub-blocks for storing a checksum (740). 체크섬(740)은 예를 들어 4 바이트 길이일 수 있다. Checksum 740 can be, for example, 4 bytes long. 플래쉬 메모리 구성(705)은 또한 또하나의 미지정 메모리 블록(771)을 포함할 수 있다. Flash memory configuration 705 can also include the addition of one or unassigned memory block 771. 본 발명에 따른 실시예에서, 메모리 블록(778, 777)에 각각 저장된 및/또는 메모리 블록(774, 773)에 각각 저장된 부트 바이너리 파일 UA 부트 1 및 UA 부트 2는 기능상 유사할 수 있으며 서로 다른 때에 업데이트 에이전트 부트 동작에 관여될 수 있다. In the embodiment according to the present invention, the memory block (778, 777) each of the stored and / or block of memory (774, 773) can be respectively similar to the stored boot binary UA boot 1 and UA boot 2 is functional in the can to each other at different may be involved in the update boot agent operates. 예를 들어, 하나의 바이너리 UA 부트 파일은 업데이트 에이전트 디폴트 시작 장소(예를 들어, 0x100000 등)로부터의 업데이트 에이전트(113)의 부트스트래핑을 수행하도록 구성될 수 있고, 다른 하나의 바이너리 UA 부트 파일은 예비 유닛 장소(예를 들어, 0x670800 등)로부터의 업데이트 에이전트(113)의 부트스트래핑을 수행하도록 구성될 수 있다. For example, a binary UA boot file update agent default start location may be configured to perform a bootstrapping the update agent 113 from (e.g., 0x100000, and so on), and the other of the binary UA boot files may be configured to perform a bootstrapping the update agent 113 from the pre-place unit (e.g., 0x670800, and so on). 따라서, UA 부트 1 및 UA 부트 2 바이너리 파일은 서로 다른 메모리 주소를 갖는 서로 다른 메모리 장소에 저장되어 있고 그곳으로부터 호출되는 업데이트 에이전트에 대해서만 동일한 기능을 수행할 수 있다. Therefore, the boot 1 and UA UA boot two binary files are stored in different memory locations each having a different memory address and may perform the same function, only the update agent that is called from it. 본 발명에 따른 실시예에서, UA 부트 1은 업데이트 에이전트 재배치가능 코드를 초기화하고 이를 업데이트 에이전트 기입 유닛으로부터 RAM, 예를 들어 도 1에 도시된 RAM(125)으로 재배치하도록 구성될 수 있다. 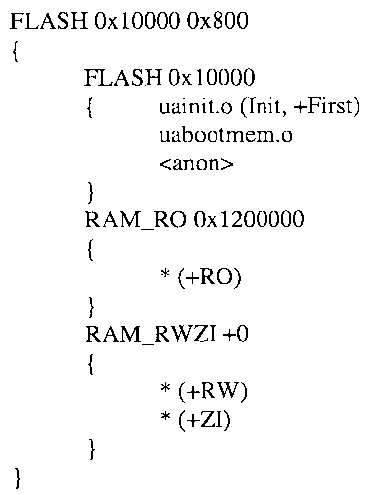 In the embodiment according to the present invention, UA boot 1 may be configured to reposition in a RAM (125) shown in Figure 1 contains a RAM, for example, from initializing the update agent relocatable code and writing this update agent unit. 본 발명에 따른 실시예에서, UA 부트 2는 업데이트 에이전트 재배치가능 코드를 초기화하고 이를 업데이트 에이전트 예비 기입 유닛으로부터 RAM, 예를 들어 도 1에 도시된 RAM(125)으로 재배치하도록 구성될 수 있다. 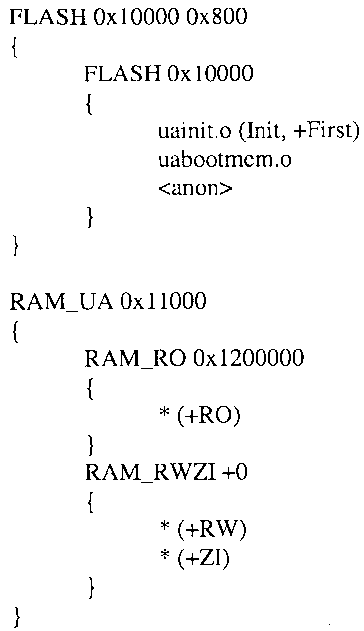 In the embodiment according to the present invention, UA boot 2 may be configured to reposition in a RAM (125) shown in Figure 1 contains a RAM, for example, it is relocatable code initializes the update agent updates from the agent pre-write unit. 본 발명에 따른 실시예에서, 업데이트 에이전트 재배치가능 코드는, 부트스트랩 코드, 예를 들어 UA 부트 1 및/또는 UA 부트 2와 함께, 전자 장치에서의 업데이트 에이전트(113)의 장애 허용 업데이트를 개시하기 바로 전에 장애 허용 업데이트를 보장하기 위해 0x100000 근방의 디폴트 장소로부터 예비 유닛(예비 메모리 장소)로 복사될 수 있다. In the embodiment according to the present invention, the update agent relocatable code, to bootstrap code, for example, with UA boot 1 and / or UA boot 2, discloses a fault tolerant update of the update agent 113 in an electronic device, just prior to ensure a fault-tolerant update can be copied from the default location 0x100000 vicinity to the spare unit (spare memory locations). 도 8은 본 발명의 실시예에 따른 예시적인 전자 장치에 대한 업데이트 에이전트(113)의 업데이트 동안의 플래쉬 메모리의 예시적인 메모리 구성(805)을 나타낸 블록도이다. Figure 8 is a block diagram showing an exemplary memory configuration 805 of the flash memory, for updating the update agent 113 for an exemplary electronic device according to an embodiment of the present invention. 플래쉬 메모리 구성(805)은 전자 장치 부트 코드를 저장하는 메모리 블록(888) 및 미지정 메모리 블록(887)을 포함할 수 있다. Flash memory configuration 805 may include a memory block (888) and unspecified memory block for storing boot code, an electronic device (887). 플래쉬 메모리 구성(805)은 또한 소거된(erased) 메모리 블록(886)을 포함할 수 있다. The flash memory configuration 805 is also erased (erased) may comprise a memory block (886). 플래쉬 메모리 구성(805)은 또한 전자 장치 애플리케이션(들)을 저장하는 메모리 블록(885)을 포함할 수 있다. Flash memory configuration 805 can also include a block of memory (885) for storing the electronic device application (s). 플래쉬 메모리 구성(805)은 또한 UA 부트 1을 저장하는 메모리 블록(884) 및 또하나의 UA 부트 2를 저장하는 메모리 블록(883)을 포함할 수 있다. Flash memory configuration 805 can also include a block of memory 883 to store the memory block 884 and another UA UA to store the boot 2 boot 1. 플래쉬 메모리 구성(805)은 또한 UA1 재배치가능 코드를 저장하는 메모리 블록(882)을 포함할 수 있다. Flash memory configuration 805 may also include a memory block 882 for storing the UA1 relocatable code. UA1 재배치가능 코드를 저장하는 메모리 블록(882)은 또한 체크섬(840)을 저장하는 서브블록을 포함할 수 있다. A memory block 882 for storing the UA1 relocatable code may also include sub-blocks for storing a checksum (840). 체크섬(840)은 예를 들어 4 바이트 길이일 수 있다. Checksum 840 can be, for example, 4 bytes long. 플래쉬 메모리 구성(805)은 또한 또하나의 미지정 메모리 블록(881)을 포함할 수 있다. Flash memory configuration 805 can also include the addition of one or unassigned memory block (881). 도 9는 본 발명의 실시예에 따른 예시적인 전자 장치에 대한 업데이트 에이전트(113)의 업데이트 절차의 완료 이후의 플래쉬 메모리의 예시적인 메모리 구성 (905)을 나타낸 블록도이다. 9 is a block diagram showing the update agent 113 is an exemplary memory configuration 905 of the flash memory after the completion of the update process of the exemplary electronic apparatus according to an embodiment of the present invention. 플래쉬 메모리 구성(905)은 전자 장치 부트 코드를 저장하는 메모리 블록(996) 및 미지정 메모리 블록(995)을 포함할 수 있다. Flash memory configuration 905 may include a memory block 996 and unspecified memory block for storing boot code, an electronic device (995). 플래쉬 메모리 구성(905)은 업데이트된 업데이트 에이전트를 저장하는 메모리 블록(994)을 포함할 수 있다. Flash memory configuration 905 may include a memory block 994 which stores the updated update agent. 플래쉬 메모리 구성(905)은 또한 전자 장치 애플리케이션(들)을 저장하는 메모리 블록(993)을 포함할 수 있다. Flash memory configuration 905 can also include a block of memory (993) for storing the electronic device application (s). 플래쉬 메모리 구성(905)은 또한 예비 유닛 메모리 블록(992)을 포함할 수 있다. Flash memory configuration 905 may also include a pre-unit memory block (992). 플래쉬 메모리 구성(905)은 또한 또하나의 미지정 메모리 블록(991)을 포함할 수 있다. Flash memory configuration 905 can also include the addition of one or unassigned memory block (991). 본 발명에 따른 실시예에서, 갱신된 업데이트 에이전트(113)는 업데이트된 업데이트 에이전트(113)에 대한 추가의 업데이트를 지원하기 위해 UA 부트 1 및 UA 부트 2와 연관되어 있는 채로 있을 수 있다. In the embodiment according to the present invention, the updated update agent 113 may stay associated with the UA UA boot 1 and the boot 2 to support the additional update for the updated update agent 113. 본 발명에 따른 실시예에서, 3-단계 부팅 방법에 대한 변동을 통합시키기 위해, 이하에 설명하는 바와 같이 한 쌍의 업데이트 에이전트 분산 로드 파일을 수정함으로써 전자 장치 이미지가 구축될 수 있다. In the embodiment according to the present invention, an electronic device an image can be constructed by modifying the pair of load balancing file update agent as described to integrate a variation of the 3-step boot method, described below. 이하의 예시적인 제1 분산 로드 파일은 출력으로서 이용될 수 있는 2개의 바이너리 파일을 참조할 수 있다. Exemplary first distributed load files below may refer to two binary file that may be used as an output. 링크 시에, 사용되는 진입점은 0x10000일 수 있다. Entry points used in the link can be 0x10000. 출력 파일은 예를 들어 배치 파일을 실행시킬 시에 사용될 수 있다. The output file can be used for example when executing the batch file, for example. 디버깅을 위해, ELF(executable and linking format) 파일도 또한 이용될 수 있다. For debugging purposes, even ELF (executable and linking format) files may also be used. 이하의 예시적인 제2 분산 로드 파일은 또한 출력으로서 이용될 수 있는 2개의 바이너리 파일을 참조할 수 있다. Exemplary second distributed load file, the following may also refer to two binary file that may be used as an output. 링크 시에, 사용되는 진입점은 0x670800일 수 있다. Entry points used in the link can be 0x670800. 출력 파일은 예를 들어 배치 파일을 실행시킬 시에 사용될 수 있다. The output file can be used for example when executing the batch file, for example. 디버깅을 위해, ELF(executable and linking format) 파일도 또한 이용될 수 있다. For debugging purposes, even ELF (executable and linking format) files may also be used. 3개의 바이너리 파일을 하나의 업데이트 에이전트 실행가능 바이너리 파일로 만들기 위해, 3개의 바이너리 파일이 병합될 수 있다. To make three binary files into one update agent executable binary file, there are three binary files can be merged. 본 발명에 따른 실시예에서, 다수의 바이너리 파일을 병합시키기 위해 예시적인 유틸리티 도구(tool)가 이용될 수 있다. In the embodiment according to the present invention, an exemplary utility tool (tool) it can be used to merge a plurality of binary files. 이하는 본 발명에 따른 실시예에서 병합을 달성하기 위해 사용될 수 있는 예시적인 명령이다. The following is an exemplary command that can be used to achieve the merging in an embodiment according to the present invention. 본 발명에 따른 실시예에서, 업데이트 에이전트의 유효성은 업데이트 에이전트를 호출하기 전에 검사될 수 있다. In the embodiment according to the present invention, the validity of the update agent may be checked prior to calling the Update Agent. 업데이트 에이전트의 유효성 검사를 지원하기 위해, 체크섬 계산이 업데이트 에이전트 바이너리 이미지에서의 체크섬 장소에 부가될 수 있다. In order to support the validation of the Update Agent, the checksum calculation can be added to the checksum location of the binary image from the Update Agent. 본 발명에 따른 실시예에서, 체크섬을 이미지 파일에 포함시키기 위해 예시적인 유틸리티 도구가 이용될 수 있다. In the embodiment according to the present invention, an exemplary utility tool may be used to contain a checksum for the image file. 이하의 예시적인 명령(들)이 이용될 수 있다. Is an exemplary instruction (s) below may be used. 본 발명에 따른 실시예에서, 예시적인 유틸리티 도구가 전술한 바와 같이 바이너리 파일들을 병합시키고 또 업데이트 에이전트 바이너리 코드에 대한 체크섬을 포함시키기 위해 배치 파일로서 이용될 수 있다. In the embodiment according to the present invention, an exemplary utility tool can be used in a batch file to include a checksum for merging and also update agent binary code, the binary file, as described above. 배치 파일을 실행시키기 위해, 업데이트 에이전트 바이너리 파일에 대한 체크섬을 포함하는 첨부 파일이 적절한 디렉토리로 복사될 수 있다. To run the batch file, the attached file containing the checksums for the binary files Update Agent can be copied to the appropriate directory. 본 발명에 따른 실시예에서, 부트 로더(111)는 업데이트 에이전트의 업데이트 상태를 검출할 수 있고 또한 업데이트 에이전트(113)를 검증할 수 있다. In the embodiment according to the present invention, the boot loader 111 is able to detect the update state of the update agent, and may also verify the update agent 113. 이와 유사하게, 순환 중복 검사(예를 들어, CRC32) 기반 체크섬 계산 코드도 또한 그 계산을 수행하기 위해 전자 장치 이미지 구축 환경에 포함될 수 있다. Similarly, (e. G., CRC32) cyclic redundancy check based on the checksum calculation code also may be included in the electronic image device deployment to perform the calculation. 전자 장치 이미지에 대한 부가의 구축(build) 명령은 또한 현재의 전자 장치 이미지를 생성한 후에 이용될 수 있다. Building (build) of the add command to the electronic image device can also be used after generating an image current of the electronic device. 구축 명령은 업데이트 에이전트(113)와 예를 들어 전자 장치 이미지의 병합을 용이하게 해줄 수 있다. Built-in command may give to facilitate the merging of the electronic device image, for example, the update agent 113. 본 발명이 어떤 실시예들을 참조하여 기술되어 있지만, 당업자라면 본 발명의 범위를 벗어나지 않고 여러가지 변경이 행해질 수 있고 또 균등물이 대용될 수 있음을 잘 알 것이다. While the present invention has been described with reference to certain embodiments, those skilled in the art will know well that the present without departing from the scope of the invention and may be made various changes can also be a substitute equivalents. 게다가, 본 발명의 범위를 벗어나지 않고 특정한 상황 또는 자료를 본 발명의 개시 내용에 적합하게 하기 위해 많은 수정이 행해질 수 있다. In addition, many modifications may be made without departing from the scope of the invention to make it suitable for a particular situation or material to the teachings of the present invention. 따라서, 본 발명이 개시된 특정한 실시예에 한정되지 않고 또 본 발명이 첨부된 청구항들의 범위 내에 속하는 모든 실시예들을 포함하는 것으로 보아야 한다. Accordingly, the present invention should be that this disclosure include all embodiments falling within the present invention is not limited to the specific embodiments In the present invention the scope of the appended claims. 을 포함하는, 업데이트 상태 표시자를 저장하는 기록 매체. Recording medium for storing cut, update status, including. 제1항에 있어서, 상기 복수의 상태 표시자는 펌웨어 및 소프트웨어 중 하나의 제1 버전을 펌웨어 및 소프트웨어 중 하나의 제2 버전으로 변환시키는 복수의 실행가능 명령어를 프로세싱하기 위해 업데이트 소프트웨어에 의해 이용되는 것인 업데이트 상태 표시자를 저장하는 기록 매체. According to claim 1, being used by the update software to process the plurality of executable instructions for converting the plurality of the indicator status of one of the first version of the firmware, and software as a second version of the firmware and software recording medium for storing the character display update state. 제1항에 있어서, 상기 복수의 상태 표시자 중 적어도 하나는 상기 전자 장치에 업데이트가 존재하고 또 업데이트가 수행되어야 함을 나타내기 위해 이용되는 것인 업데이트 상태 표시자를 저장하는 기록 매체. The method of claim 1, wherein at least one of said plurality of status indicator is a recording medium for storing the character display update status will be used to indicate that it should be updated is present in the electronic device, and the update is performed again. 제1항에 있어서, 상기 복수의 상태 표시자 중 적어도 하나는 업데이트될 펌웨어 및 소프트웨어 중 상기 하나가 유효하고 업데이트될 수 있는지 여부를 나타내기 위해 이용되는 것인 업데이트 상태 표시자를 저장하는 기록 매체. The method of claim 1, wherein at least one of storing characters that the update status is used to indicate whether or not there is the one of the firmware and the software to be updated may be valid and updates the recording medium of the plurality of status indicators. 제1항에 있어서, 상기 복수의 상태 표시자 중 적어도 하나는 상기 업데이트의 어느 단계가 현재 수행되고 있는지를 나타내기 위해 이용되는 것인 업데이트 상태 표시자를 저장하는 기록 매체. The method of claim 1, wherein at least one of said plurality of status indicator is a recording medium for storing the character display update state will be used for indicating that the update is performed at any stage of the current. 제1항에 있어서, 상기 복수의 상태 표시자 중 적어도 하나는 업데이트될 펌웨어 및 소프트웨어 중 상기 하나의 업데이트가 완료되었음을 나타내기 위해 이용되는 것인 업데이트 상태 표시자를 저장하는 기록 매체. The method of claim 1, wherein at least one of storing characters that the update status is used to indicate that the one of the update has been completed of the firmware and the software is updated, the recording medium of the plurality of status indicators.